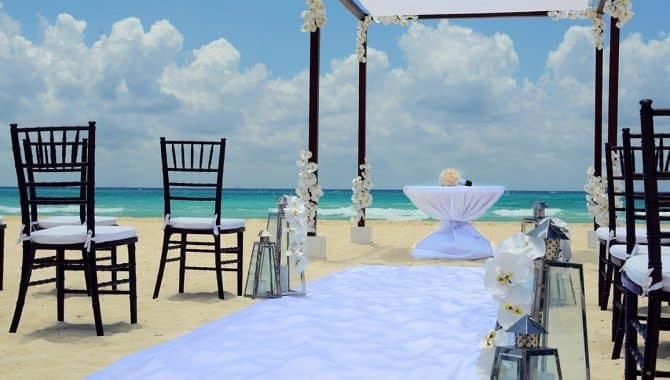 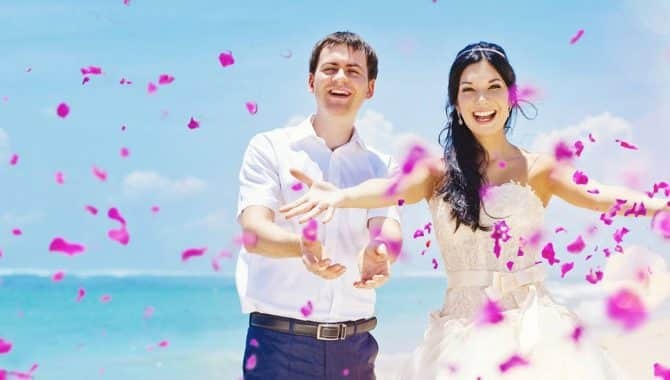 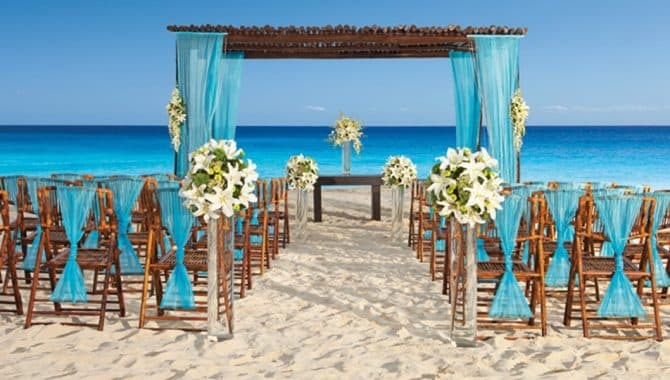 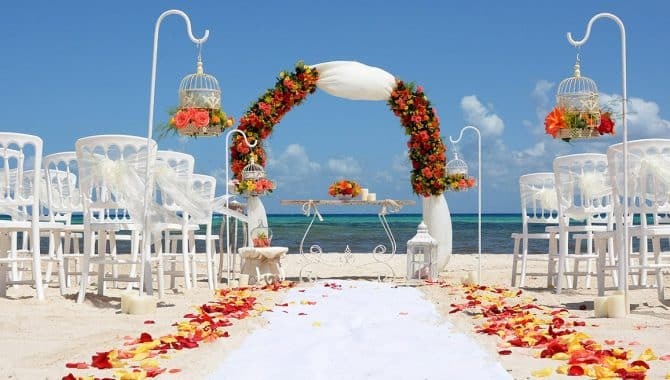 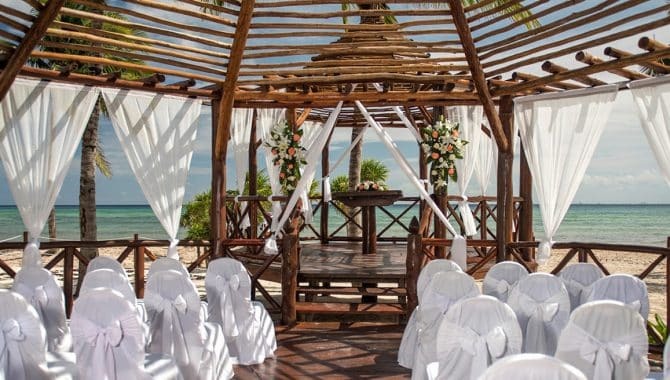 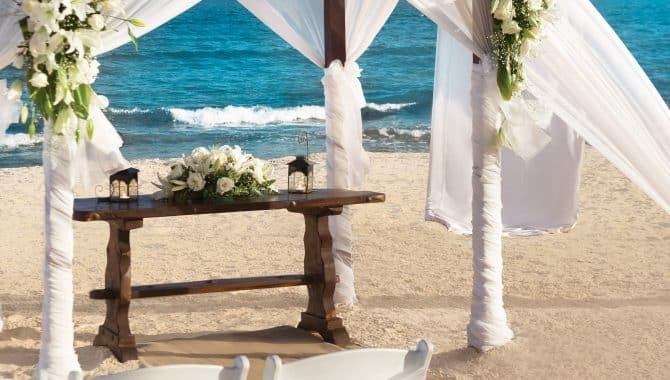 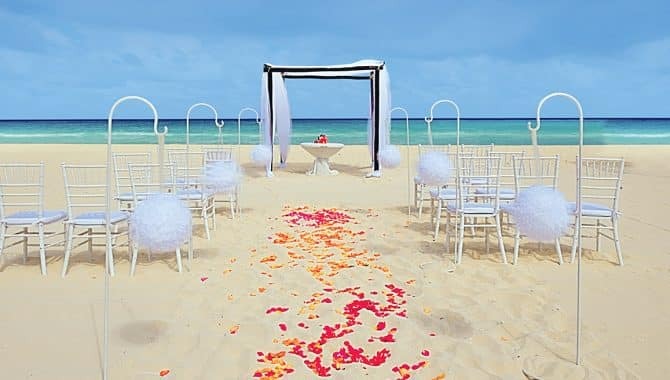 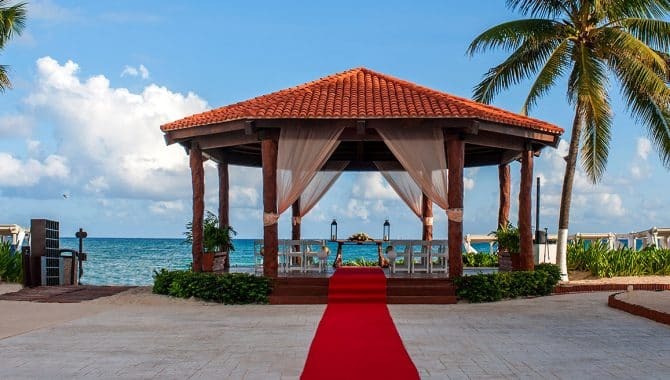 Considering Playa del Carmen’s white-sand shores and trendy vibe for your upcoming beach wedding? 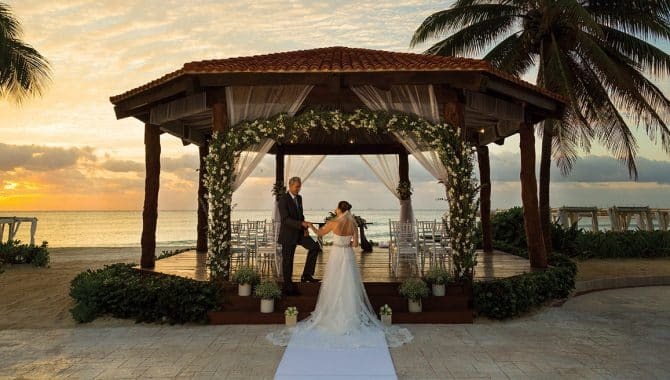 These beach resorts have all the amenities you need for an unforgettable wedding in paradise. 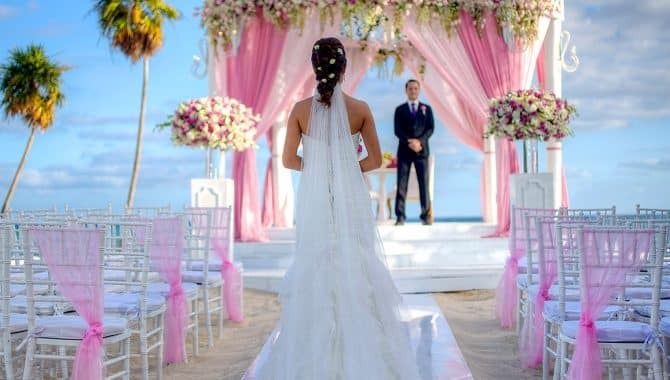 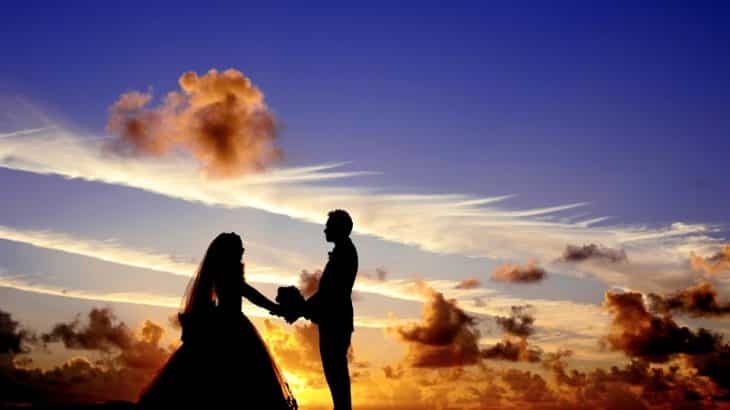 Whether you’re looking for an intimate gathering of your closest family and friends or a big celebration, the on-site wedding coordinators and packages will make your wedding planning stress-free. 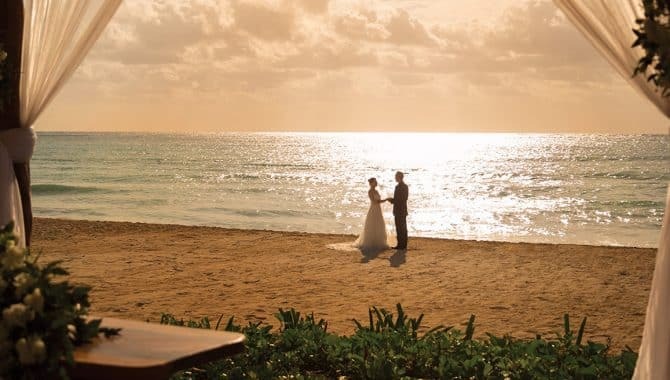 And once you’ve said “I do,” you’re in proximity of world-class snorkeling, Mayan ruins and authentic culture. 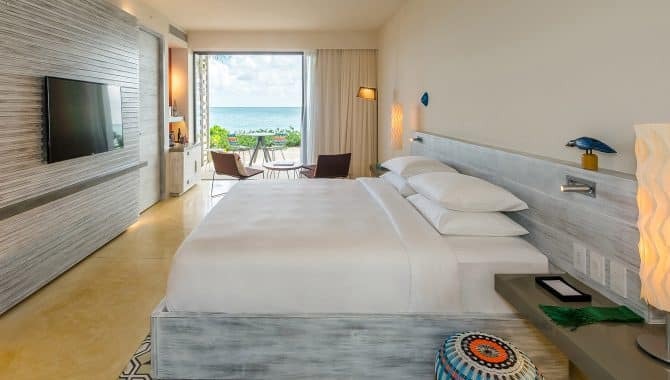 Enjoy the best in boutique luxury when you plan a stay at the Andaz Mayakoba Riviera Maya Resort in Playa del Carmen. 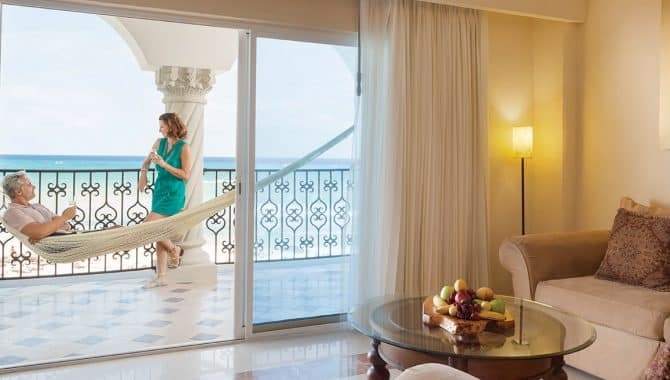 Start each day with a complimentary breakfast buffet, but not before you take in the view from your spacious suite. 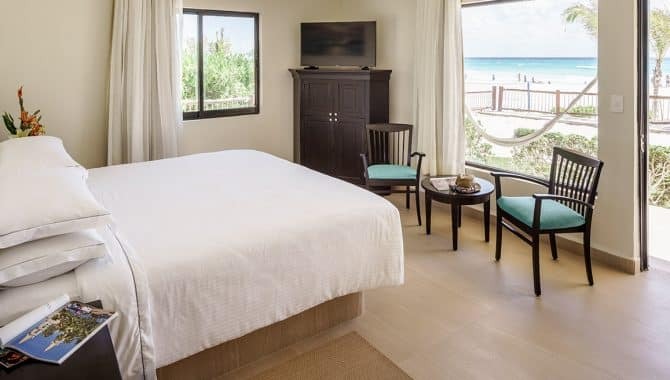 Beachfront rooms comprise about half of the property’s accommodation options—and the view of the ocean is known to be breathtaking—while other rooms sport their own impressive views of serene lagoons and Playa del Carmen’s lush tropical greenery. 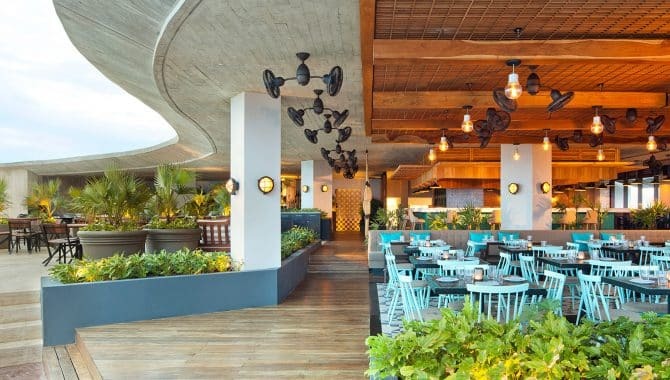 The four restaurants at the Andaz provide creative spins on traditional Latin American cuisine, offering flavors that are both accessible and adventurous while playing up local ingredients, like freshly caught seafood. 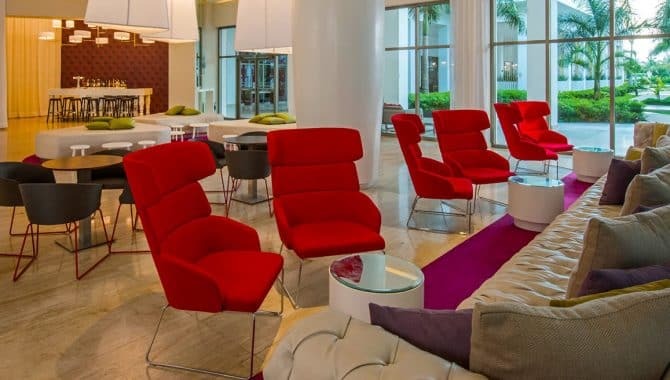 While the hotel is large, guests are welcome to hop on a bike (no fee required) to get around. 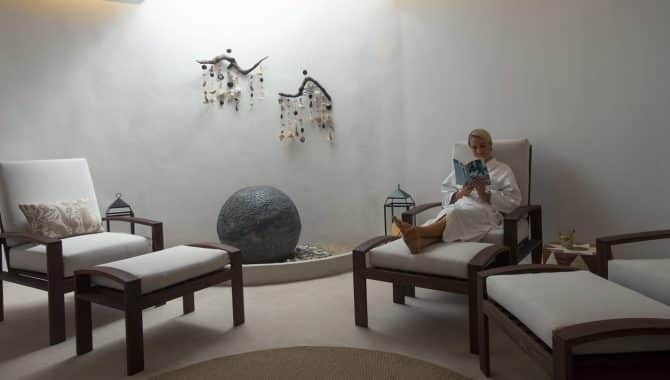 If you’re traveling here as a family, you won’t no one will miss out on fun or relaxation with the hotel’s luxurious Naum Wellness & Spa and the on-site kids program. 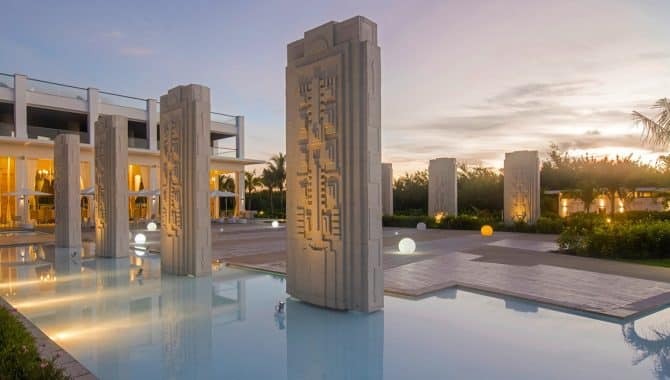 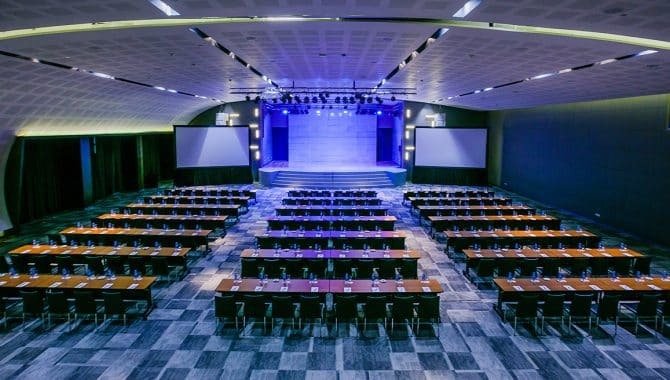 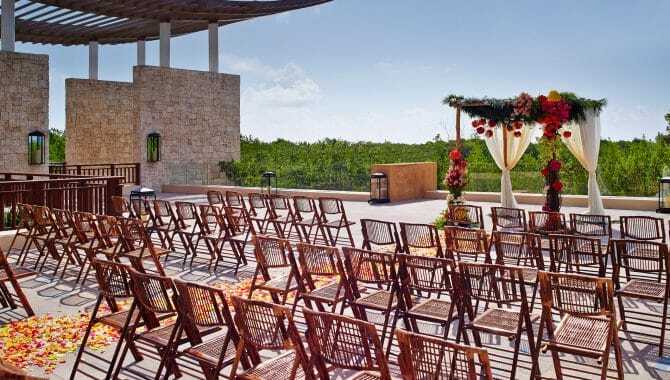 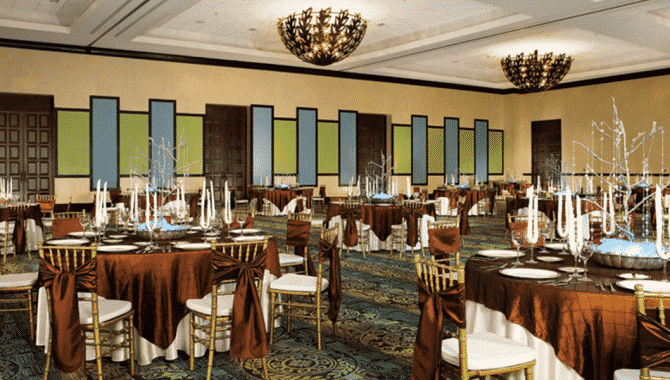 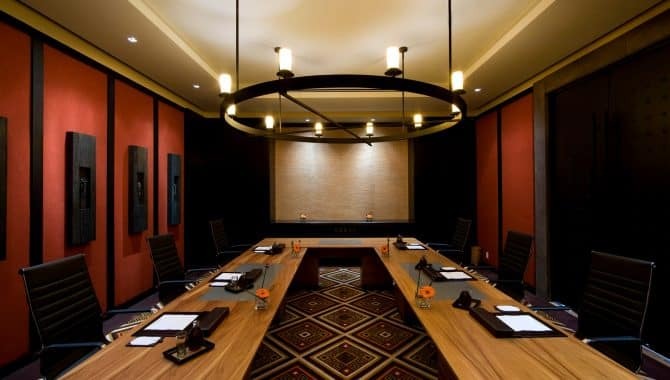 Andaz Mayakoba Riviera Maya Resort is also an ideal location for large events—whether you’re hosting a business conference or destination wedding, the 14,000 square feet of event space is sure to wow guests. 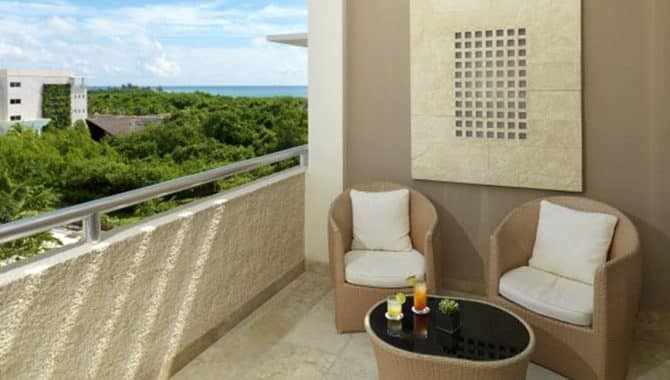 All these impressive features, plus access to the El Camaleón Golf Club and the Mayakoba Tennis Center, make this a great choice for your next beach getaway. 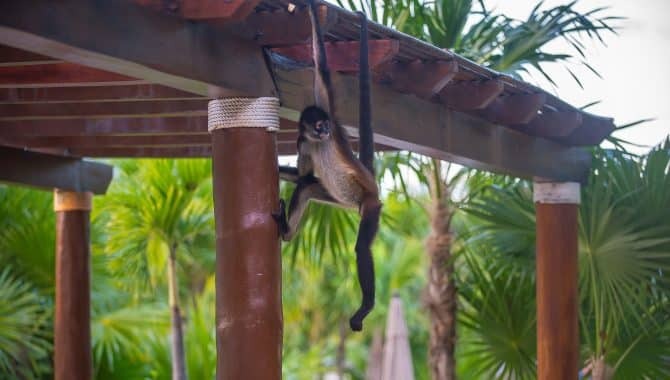 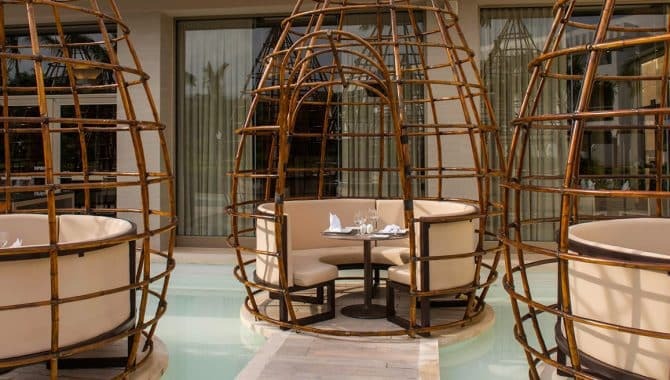 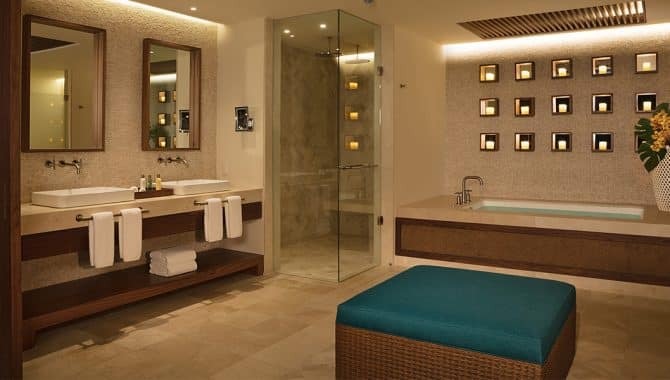 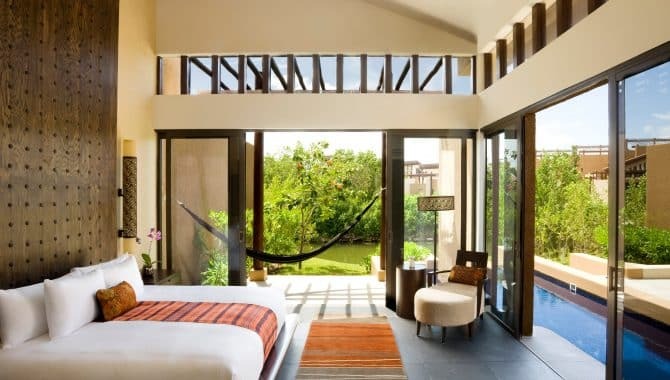 If you’re looking for a resort that boasts both stylish architecture and stunning natural beauty, a kid-friendly atmosphere, and lots of on-site amenities and activities, look no further than the Banyan Tree Mayakoba Resort in Playa del Carmen. 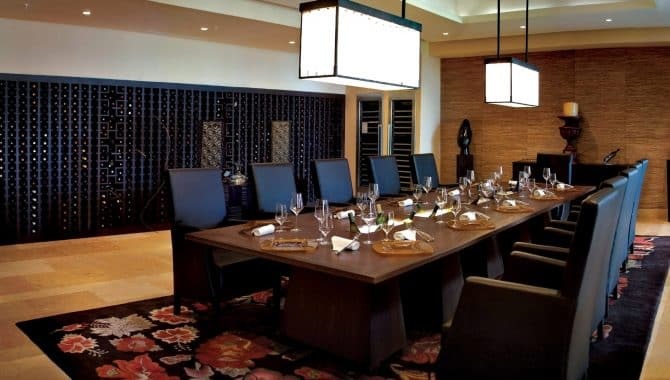 The options here are endless, beginning with the eclectic dining options—all of which are rated highly by guests and critics alike. 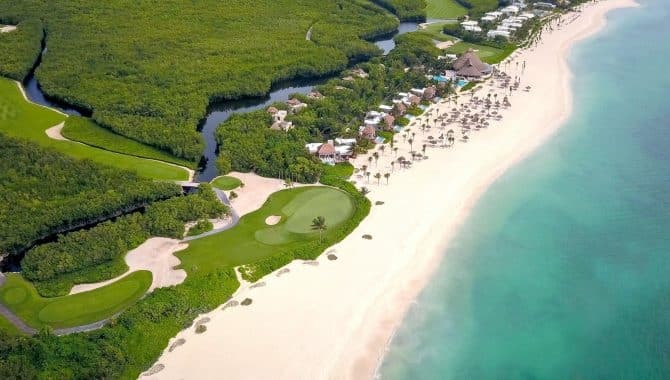 And, whether you’re working on your handicap or playing for the love of the game, playing through the 18 holes at El Camaleon—home to the annual Mayakoba Golf Classic, the only PGA Tour event in Mexico—is a must. 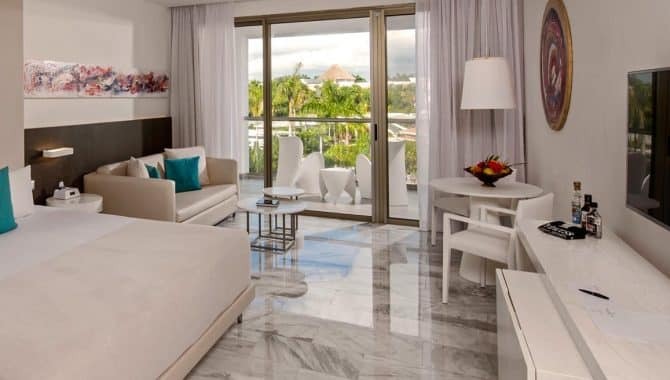 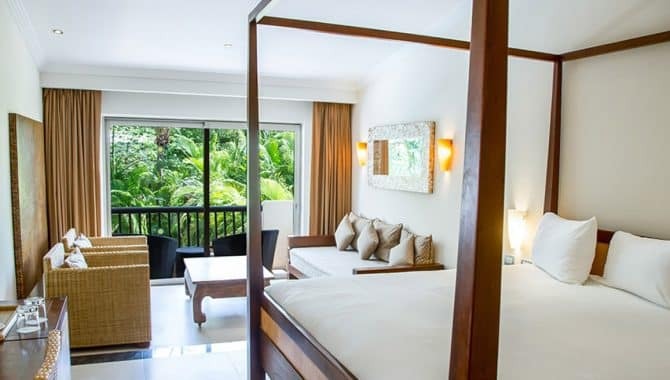 Of course, after a long day at the golf course, you’ll want to unwind in your own private paradise, and the rooms here fit that bill perfectly. 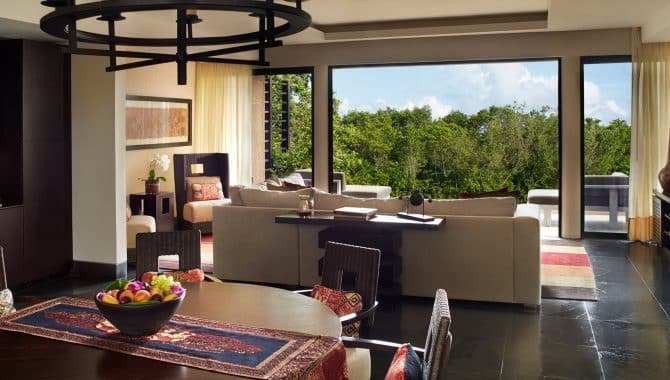 Each of the Banyan Tree’s luxury villas is quite large and showcase the same impeccable eye for design you’ll see on the rest of the property. 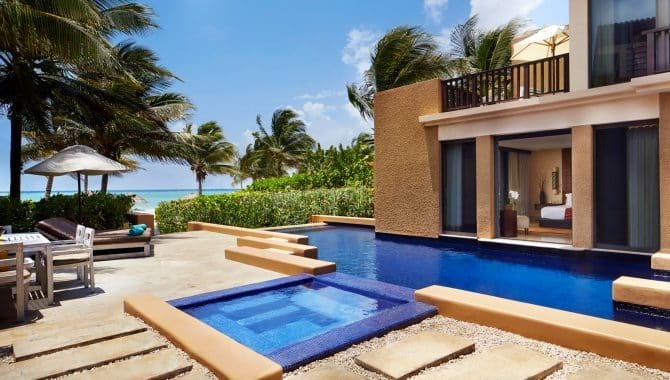 On top of that, each comes with its own private garden area, complete with its own pool—meaning you won’t have to compete for a lounge chair when it comes time to go for a swim. 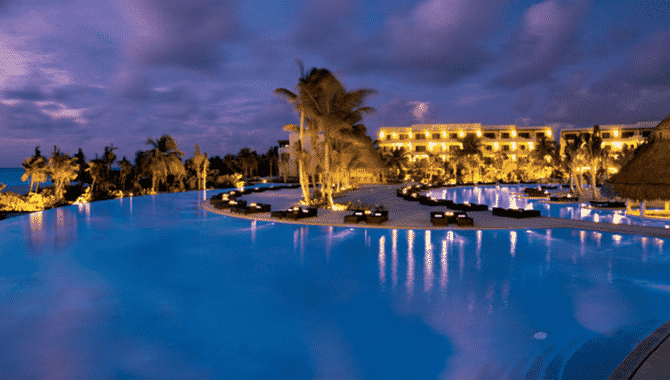 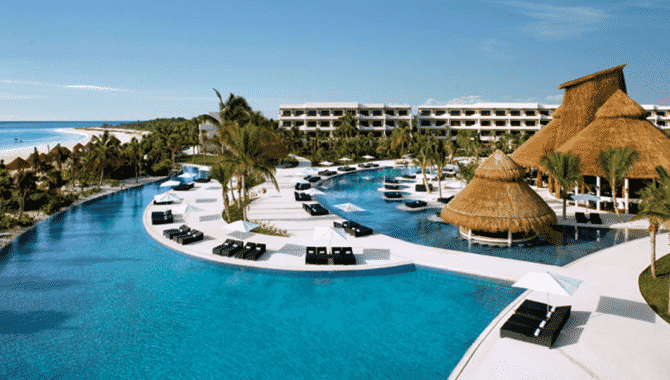 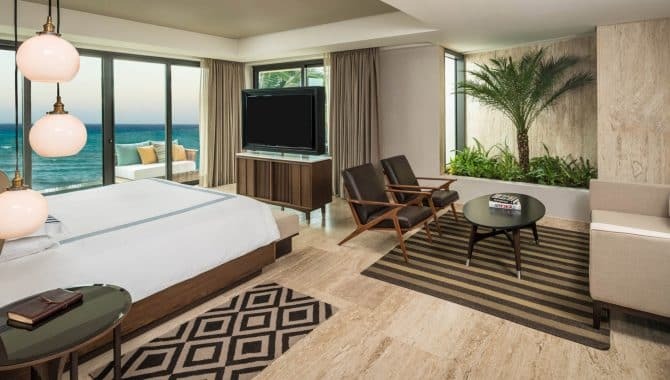 Smack-dab in the middle of the Mayan Riviera’s hottest tourist destination, Hilton Playa del Carmen provides exactly the kind of luxury you want on your Mexican beach getaway. 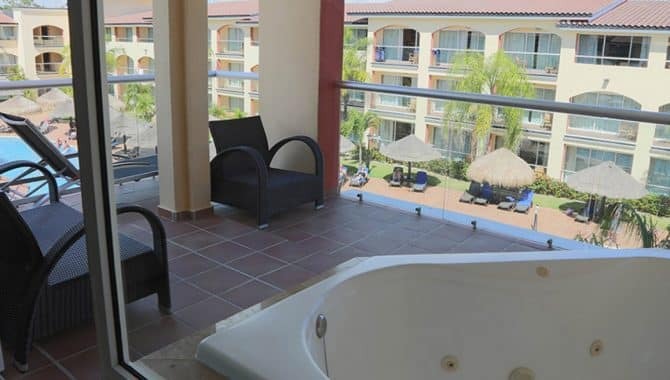 All accommodations are suites, and all have private balconies or terraces as well as whirlpool tubs. 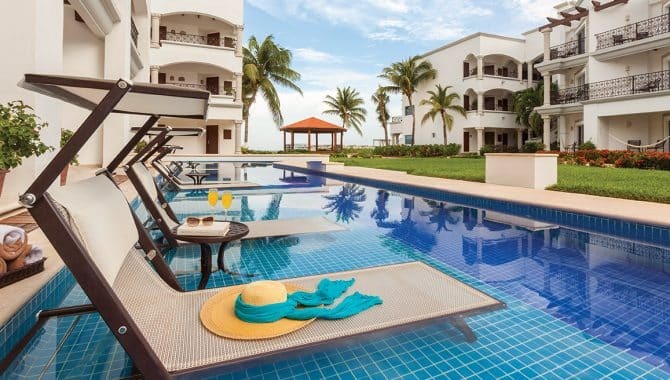 Swim-up suites are available, as well as suites with beachfront walkouts. 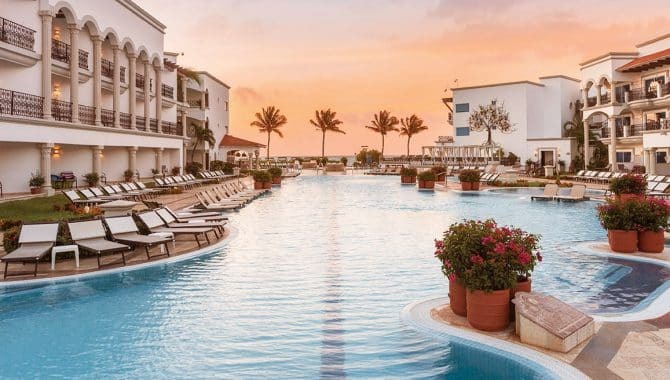 Unwind at the beach or at one of the resort’s pools; find a spot at the Olympic-sized freshwater pool, tranquil relaxation pool or in-pool hot tubs. 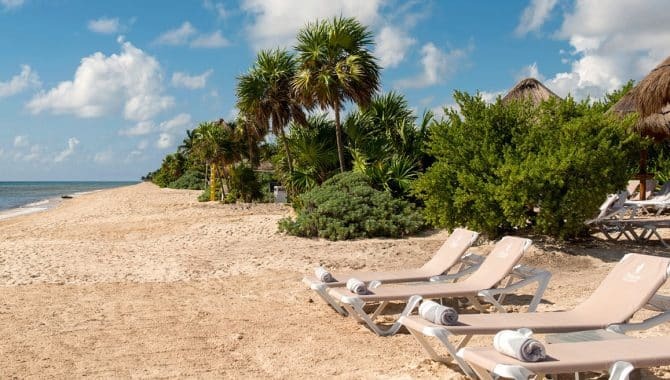 Then, once your stresses have melted away, there are plenty of activities to fill the sunshine-splashed days: volleyball, tennis, Pilates, snorkeling, culinary classes, dance lessons, scuba lessons, kayaking and ping pong are some of the many things you can do without ever leaving the property. 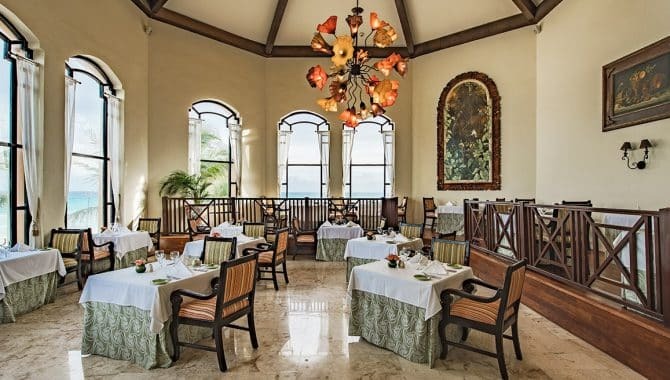 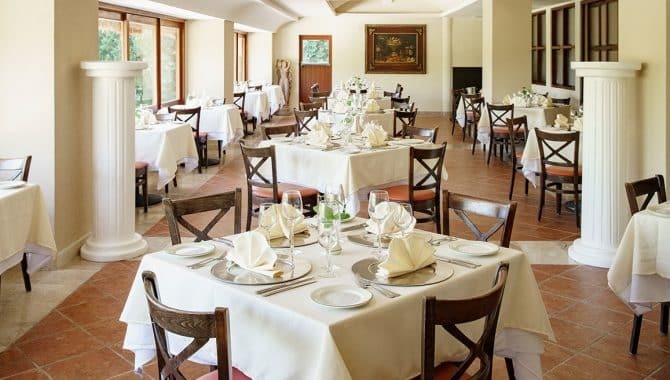 The resort’s seven restaurants offer cuisine for every taste and mood. 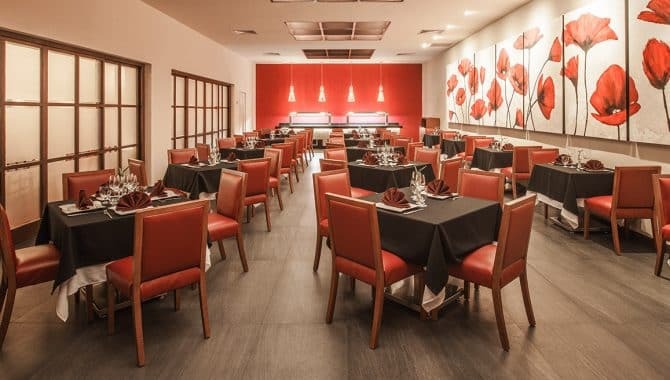 Choose from Asian fusion, traditional Mexican, Mediterranean, Mexican-French fusion, Caribbean fusion, American and International cuisine. 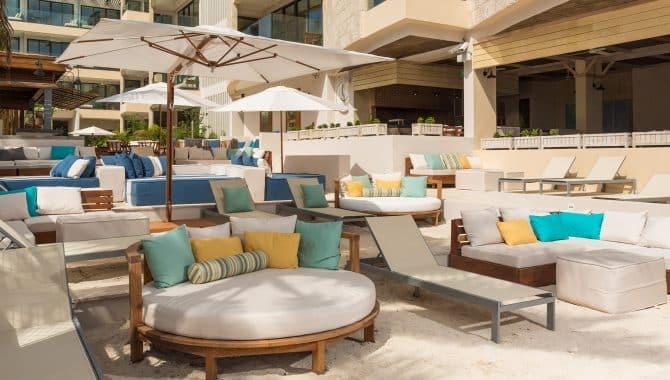 Sample tequila at the Tequileria & Cigar Club Bar, relax poolside at the Trade Winds Bar, catch your favorite game at the Lobby Bar, or enjoy a perfect cup of coffee at the Royal Coffee House, the resort’s European-style gourmet café. 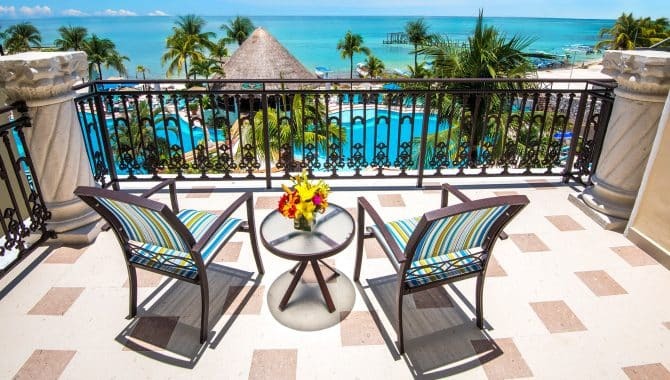 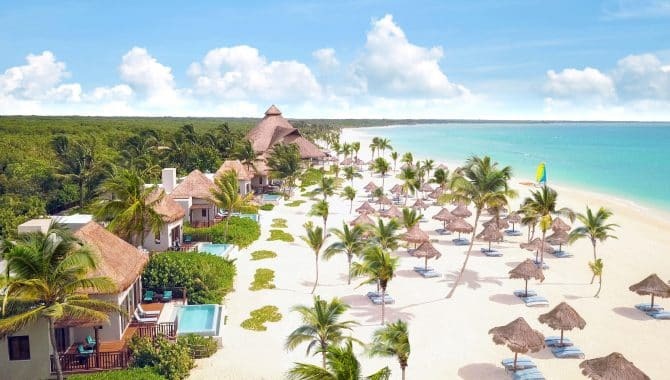 Mahekal Beach Resort features 196 rooms with ocean or garden views, and many are thatched-roof bungalows. 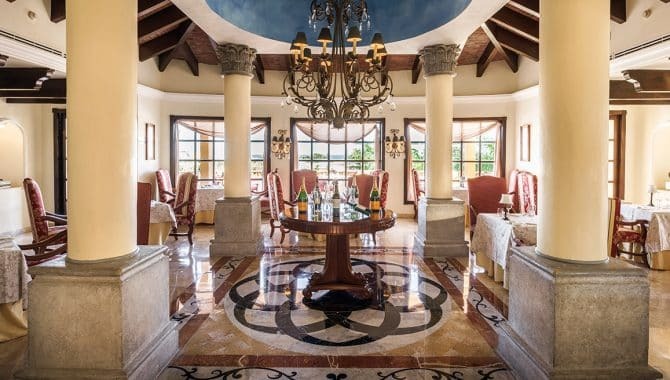 The décor—described by the resort itself as “Gypset style”–tastefully and seamlessly blends Mexican tradition with forward-thinking design. 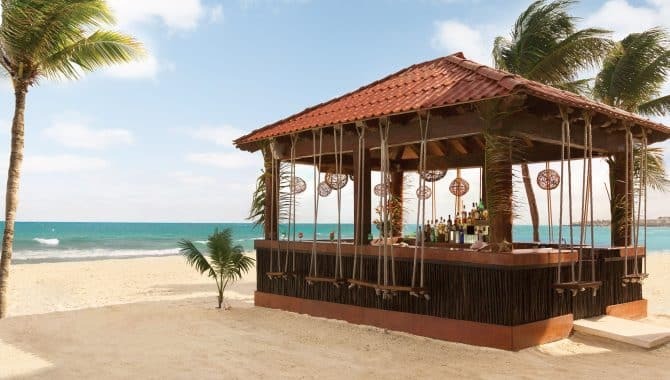 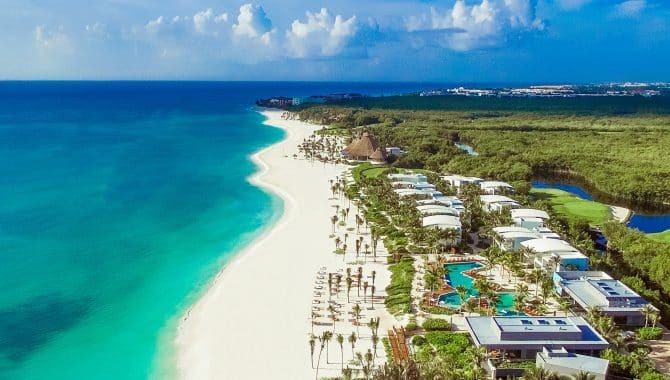 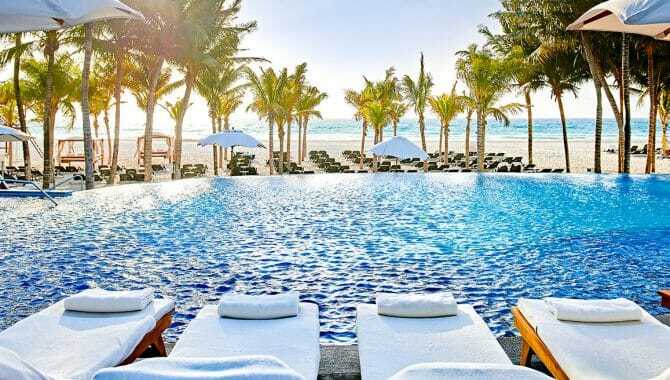 The beach is, of course, the main attraction, and 920 feet of soft, white sand–the longest uninterrupted beach in Playa–is just what the doctor ordered to unwind and disconnect. 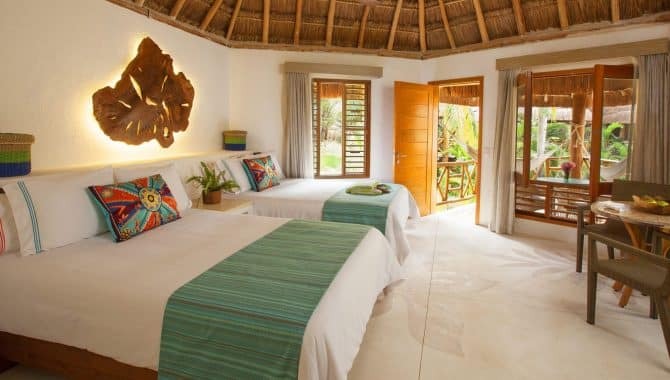 Recent additions to the resort include an ice cream shop and a boutique that offers exclusive Mahekal beachwear and unique, locally-made gifts and art. 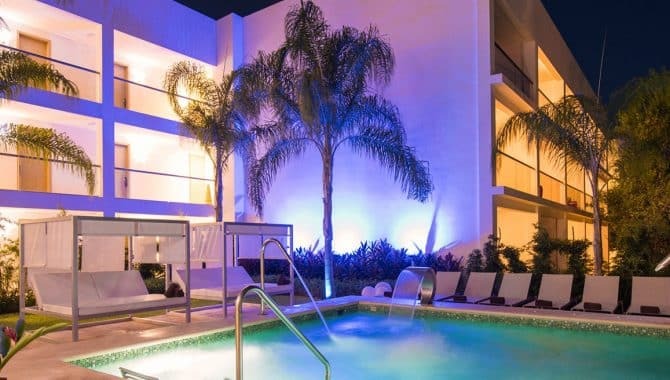 Four pools are located onsite, including an infinity pool, a heated pool with a hot tub and a pool with a swim-up bar. 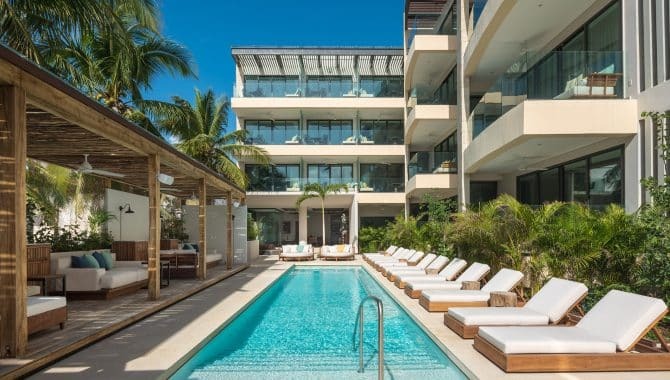 Choose the Las Olas Pool for a gorgeous beachfront setting or the Treehouse Pool for a serene garden location; you’ll share the space with birds, iguanas and lush jungle vegetation. 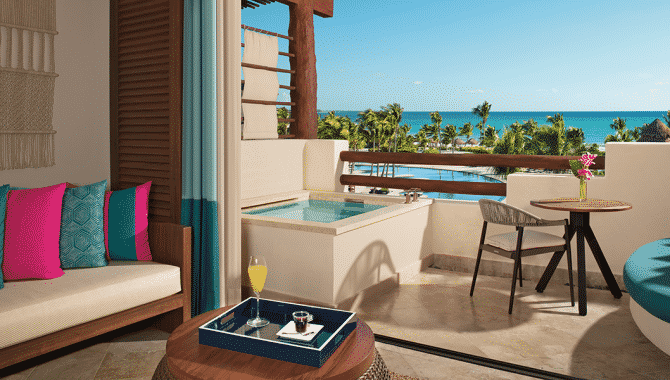 Additionally, many of the oceanfront casitas have their own private plunge pool. 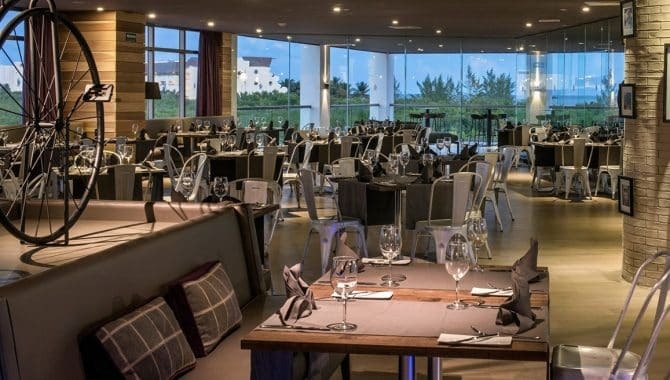 Three bars and three restaurants are on-premises and ready to serve guests. 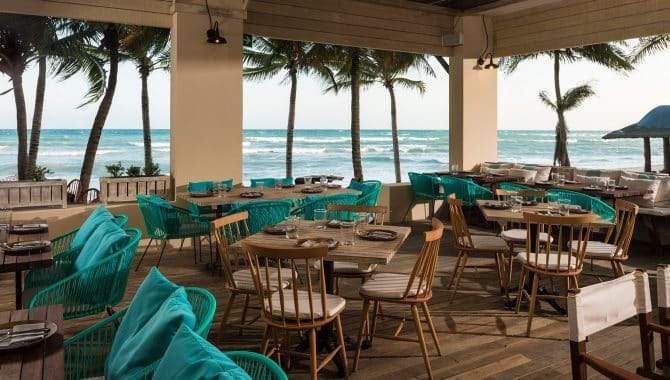 The Cocina Restaurant is open-air and great for a breezy lunch, while Las Olas Restaurant and Bar offers a magical nighttime setting by the glow of the pool lights. 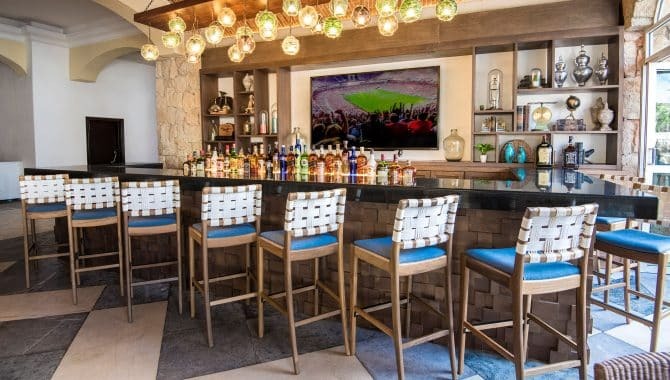 Check out Boli’s Bar for drinks and a fun atmosphere, and try your skills at table tennis or at one of the cobalt-blue pool tables. 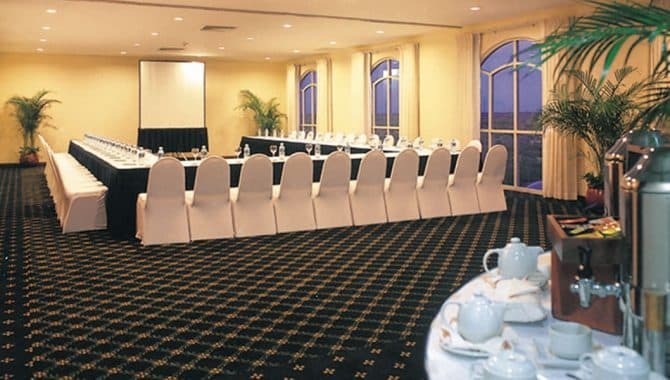 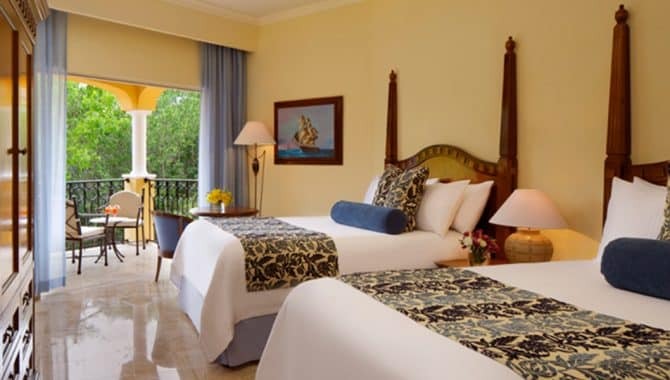 Panama Jack Resorts Playa del Carmen provides the comfort of home with the hands-off convenience of a large hotel. 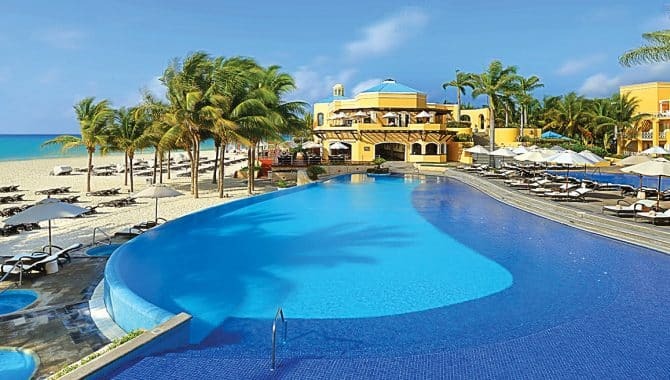 The all-inclusive resort offers something for visitors of all ages. 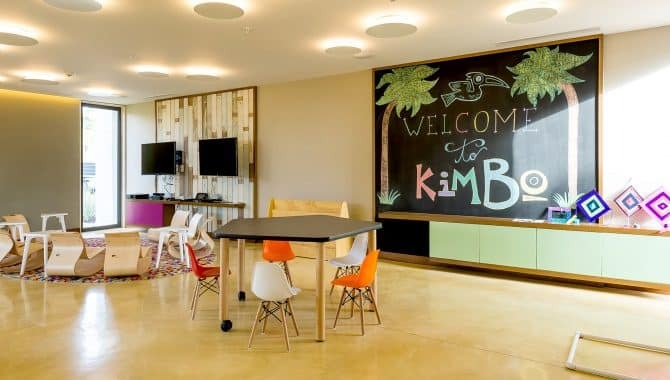 The Camp Jack program offers kid-friendly fun with face painting, arts and crafts, and mini-golf. 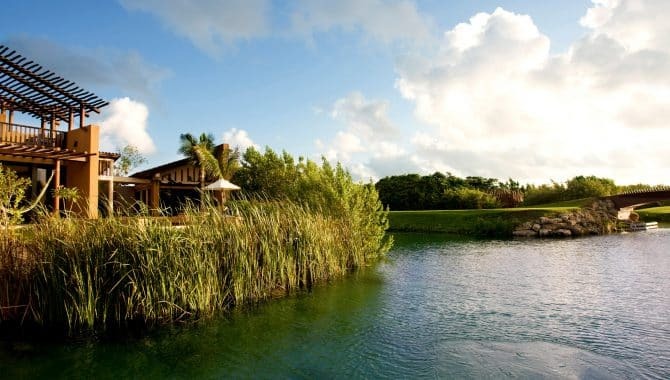 There’s also the T-Zone, which is designed to offer exciting activities for teenagers. 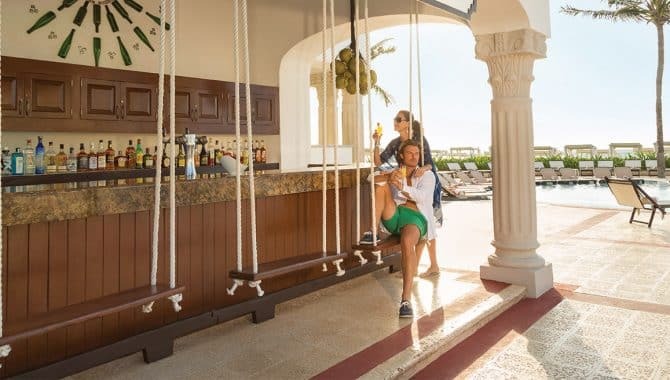 When the parents are ready to unwind, there are plenty of upper-level activities complete with jaw-dropping views of the Caribbean Sea. 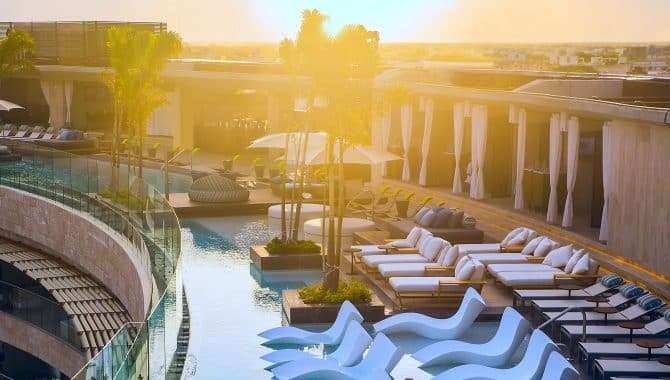 Lounge next to the second-floor pool or take a relaxing dip in the hot tub before grabbing fresh seafood from Off the Hook—the hotel’s beloved rooftop sushi bar. 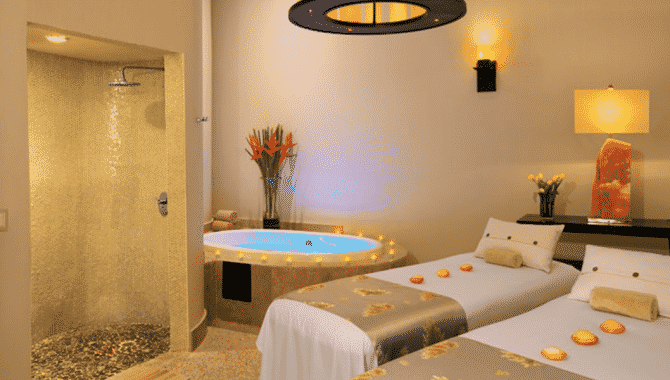 Follow up your meal with a relaxing visit to the Playa del Carmen resort’s Aura Spa for a couples massage, mud wrap or anti-aging treatment. 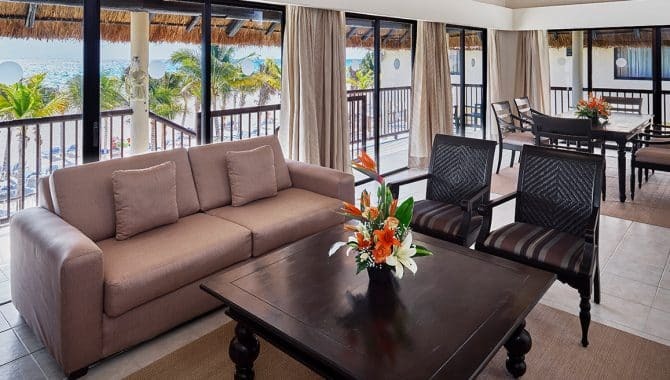 The laid-back atmosphere of the resort also extends to its suite options. 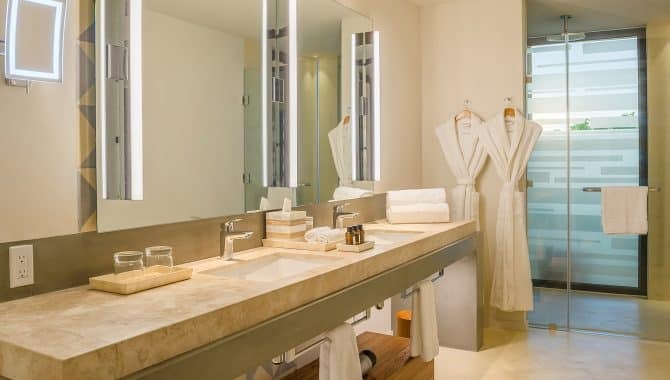 From standard to premium, every style of accommodation is fitted with convenience and comfort in mind, which includes free WiFi and a mini-bar that’s restocked daily. 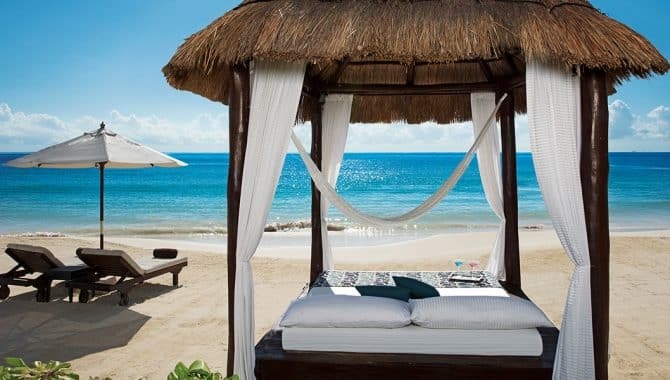 Want to wake up and hit the beach? 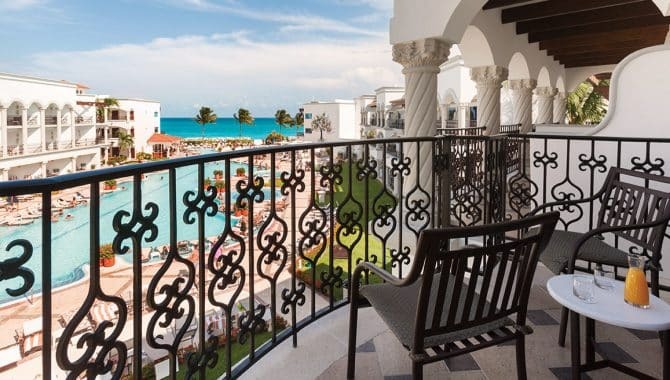 Choose a beachfront walk-out option or for elevated views, opt for an oceanfront suite with a private balcony. 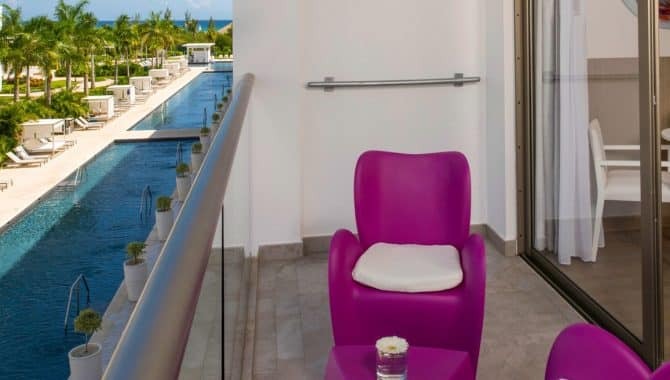 The Riviera Maya is known for its all-inclusive vacation experiences and the Platinum Yucatán Princess All Suites & Spa Resort continues this tradition. 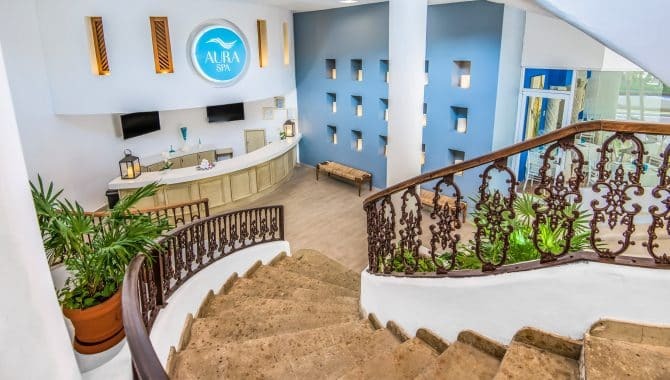 As the name suggests, the resort boasts its own spa and wellness center, which features saunas, fitness areas and a variety of beauty-treatment options. 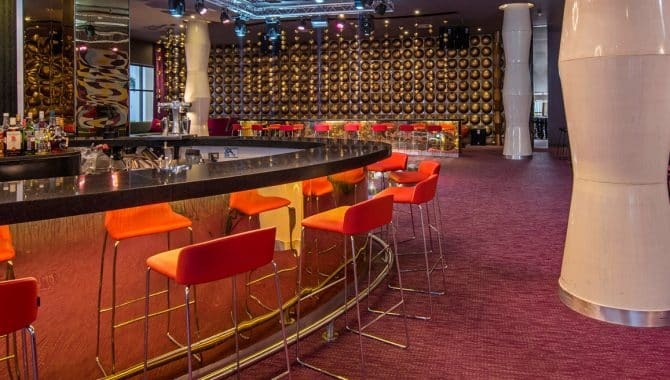 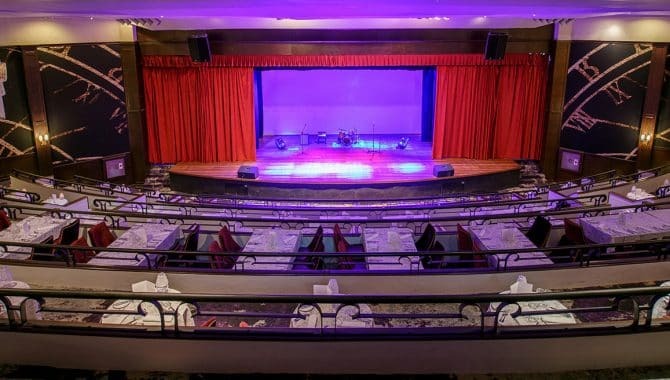 There are also six on-site restaurants, seven bars and a nightclub, all within a short walk from your suite. 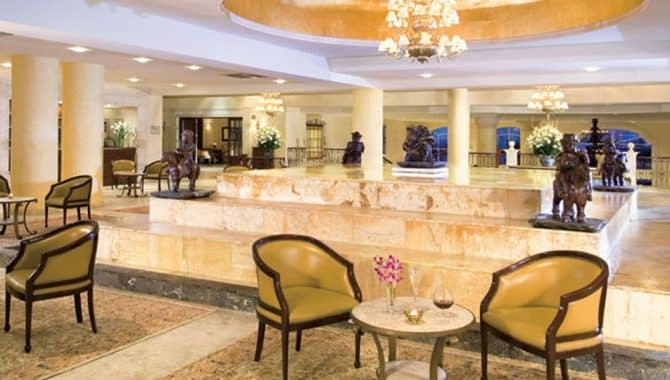 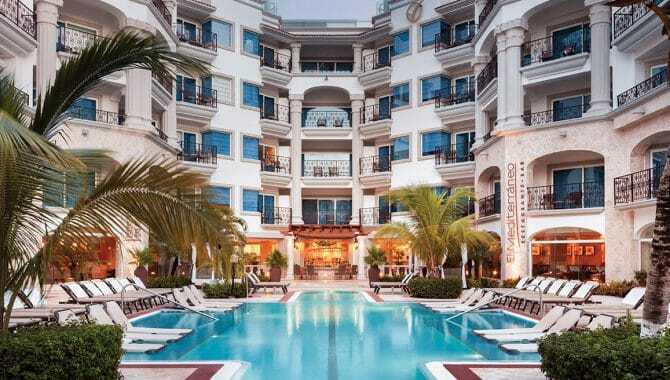 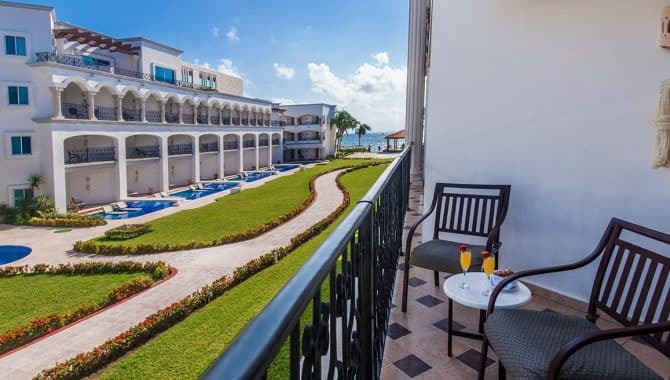 As part of the Grand Princess family, staying at the Platinum Yucatán Princess provides you instant access to all the facilities at the Grand Riviera Princess and Grand Sunset Princess Hotels. 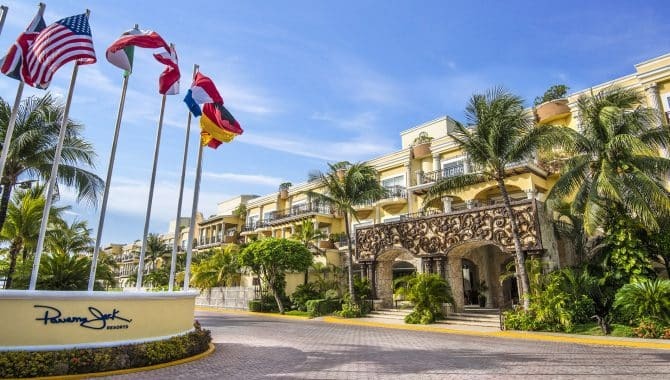 For sports enthusiasts, the Casa Club and Sport Park offers endless opportunities for indoor and outdoor leisure activities, including table tennis, archery, baseball and paddle boarding. 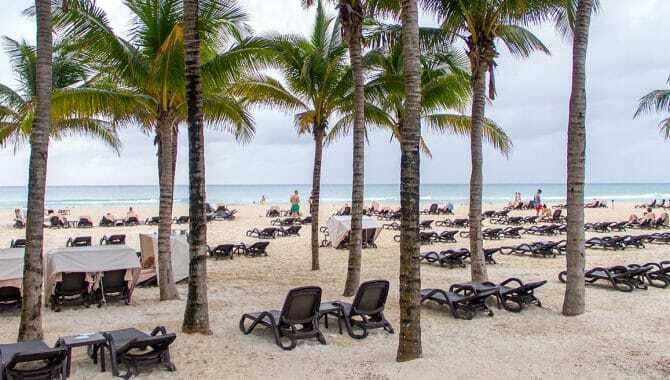 All these adventures take place surrounded by the majestic scenery for which the Riviera Maya is known. 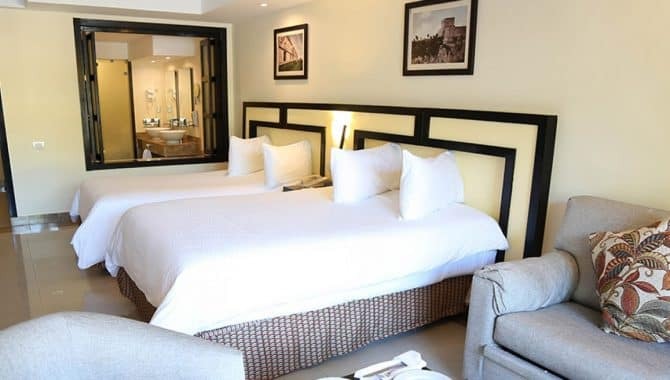 Each of the hotel’s 472 rooms exudes luxury with crisp, clean decor and modern furnishings. 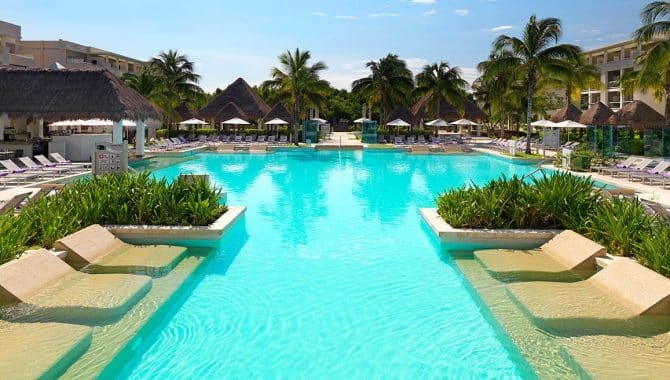 Want to wake up and instantly hit the pool? 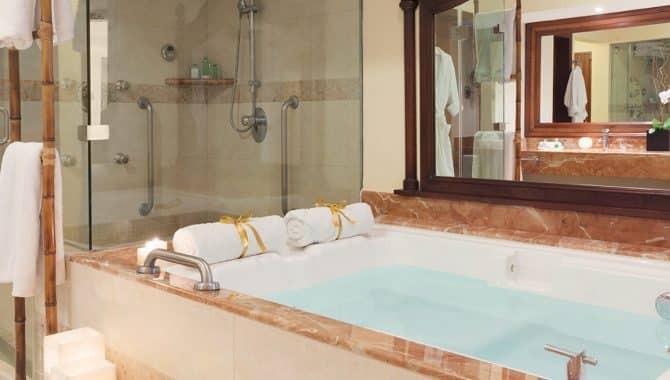 There’s direct pool access available with each of the resort’s three room levels—Junior Suite, Platinum Deluxe and Honeymoon Suite. 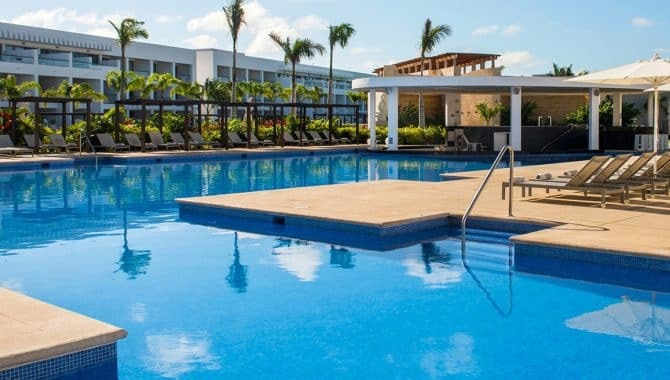 Simply choose the Swimout variation of the style that suits your needs for the ultimate level of pool-side convenience. 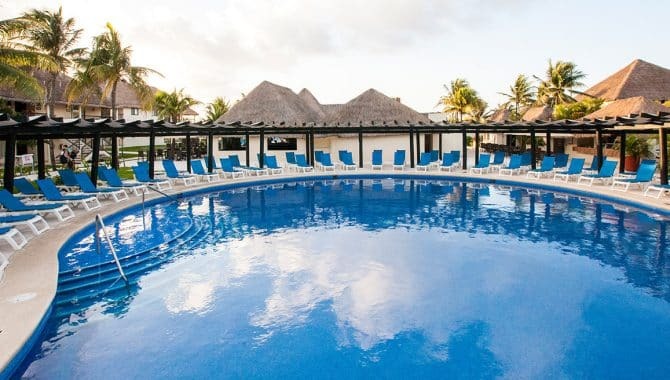 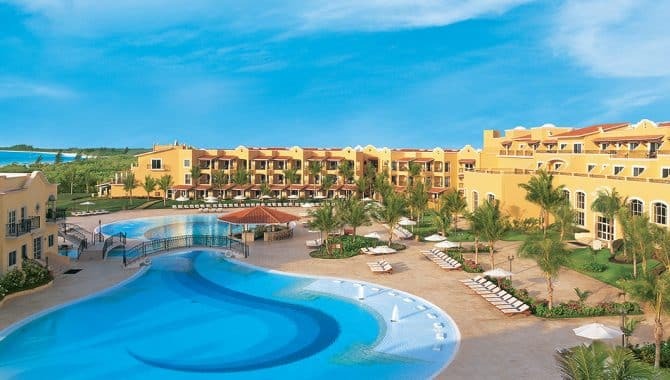 Sandos Playacar Beach Resort offers a refreshing approach to all-inclusive accommodations by meeting the unique needs of both families and adult vacationers. 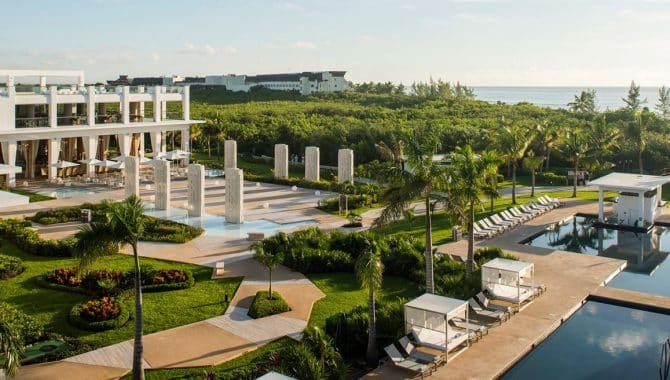 For couples who want to enjoy a stress-free vacation, the Select Club provides access to adult-only sections of the resort—including exclusive access to a kid-free pool, spa, bar, restaurants and section of the beach. 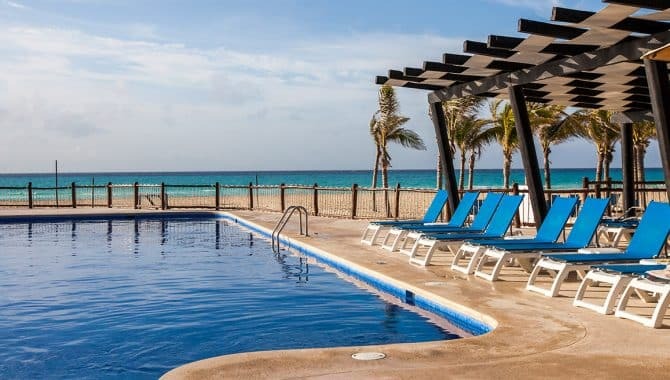 Families, on the other hand, will enjoy access to the resort’s Kids and Teen clubs, both of which are supervised by trained staff. 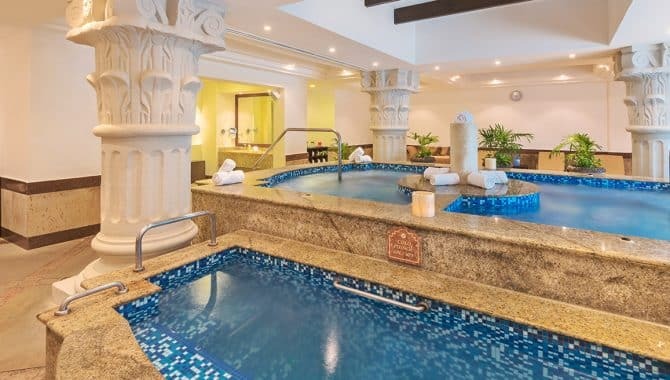 Parents can take a break with a spa visit or trip to the thermal areas before rejoining the rest of the family for a round of miniature golf. 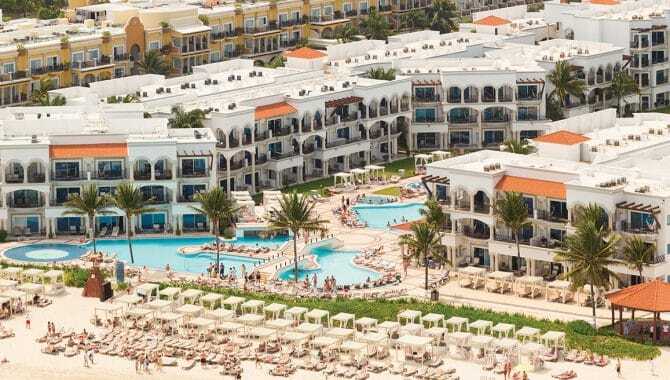 Everyone in the resort has access to eight pools, a hydromassage hot tub and water sports center. 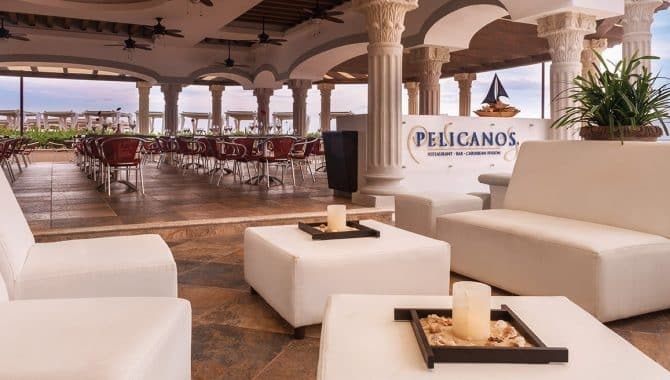 There is also a performance stage in the Main Plaza, which features nightly entertainment. 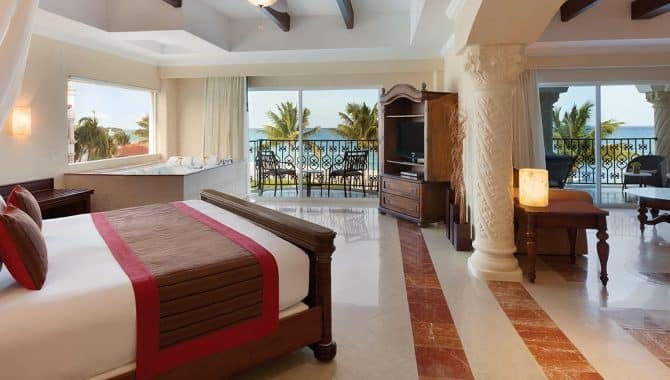 Sandos Playacar offers 819 rooms, and each is decorated to reflect local culture and style. 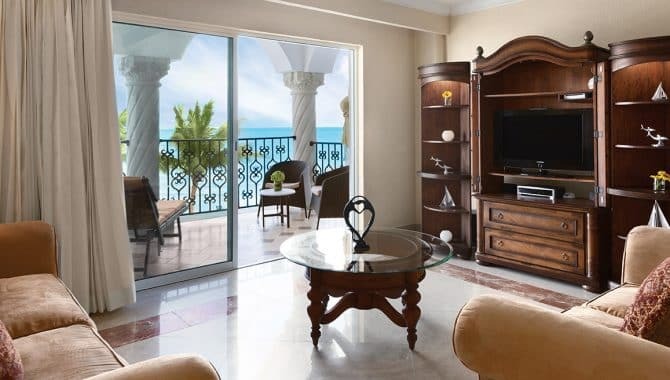 There are multiple suite options in both family and adult sections of the resort, and some of them are available with ocean views. 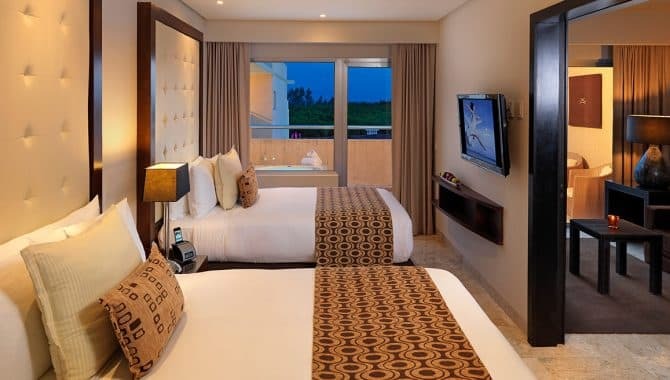 All rooms are equipped with an in-room safe, minibar and coffee maker. 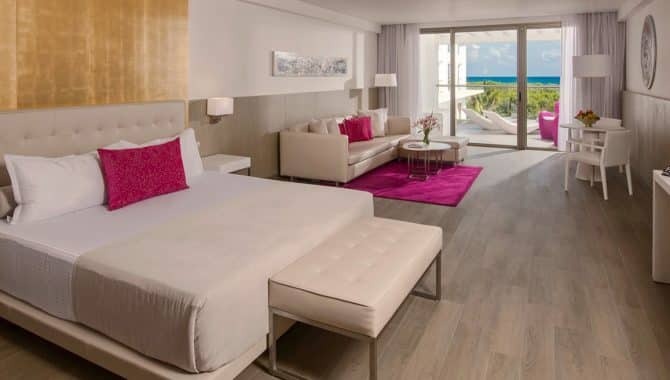 Travelers to Playa del Carmen don’t have to choose between the relaxing atmosphere of a boutique hotel and the vast amenities of large resorts—Secrets Capri Riviera Cancún offers the best of both worlds! 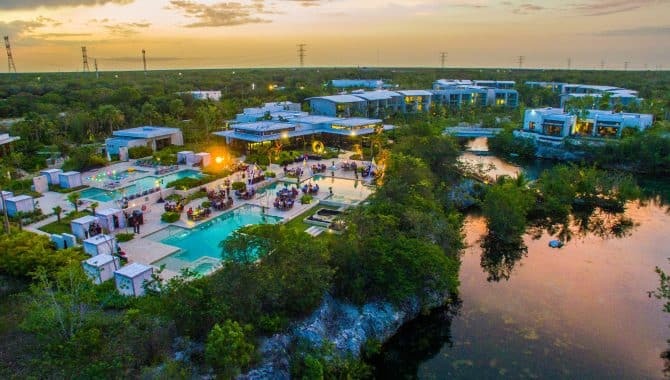 Sitting on 71 acres, this adults-only resort offers plenty of opportunities for couples to relax, reconnect and take on adventures. 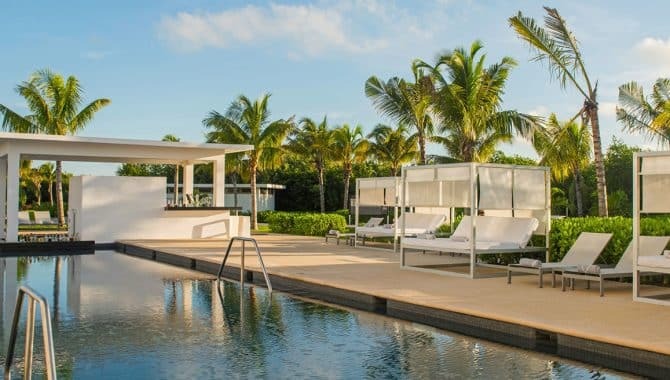 Both the 16,000 square foot heated pool and beach area are fitted with lounge chairs and Bali beds, perfect for soaking in the soothing rays or taking a well-deserved nap. 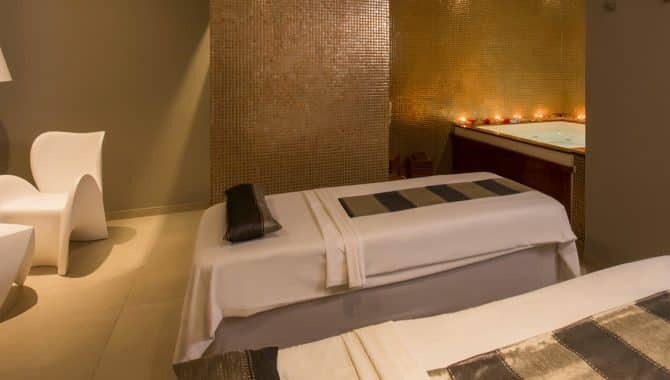 For the ultimate day of self-care, visit the renowned Secrets Spa by Pevonia for a hot-stone massage, facial or hydrotherapy treatment. 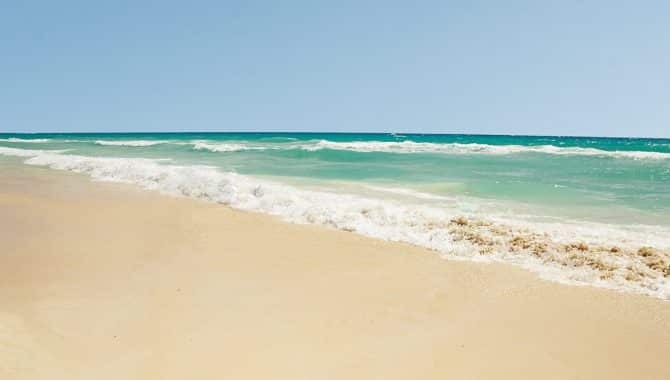 Ready for some adventure? 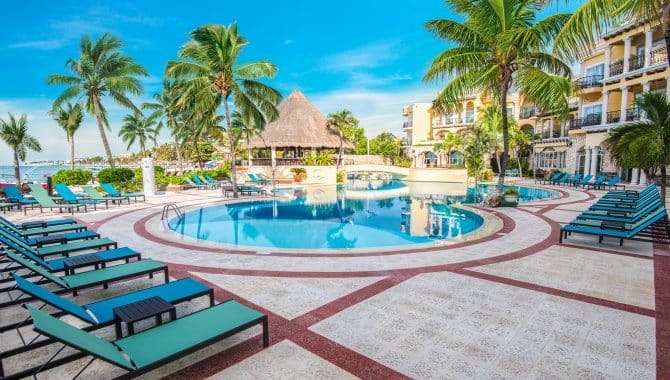 Reserve a spot on the resort’s bicycle tour, sign-up for a Latin American dance class or hit the water with a kayak or paddleboard. 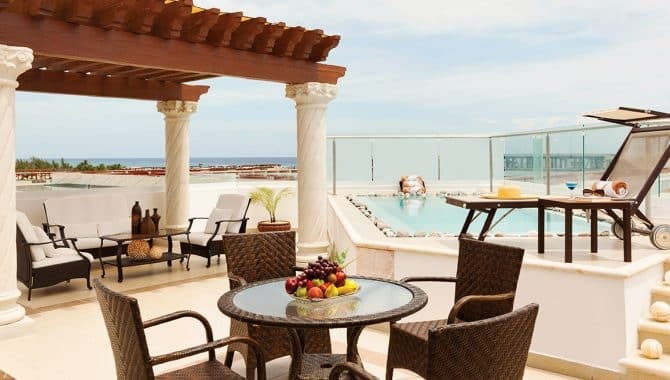 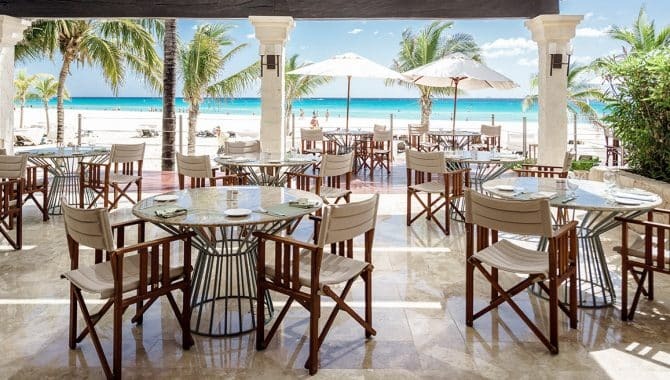 Guests at Secrets Capri Riviera Cancún can choose from five on-site restaurants and one café. 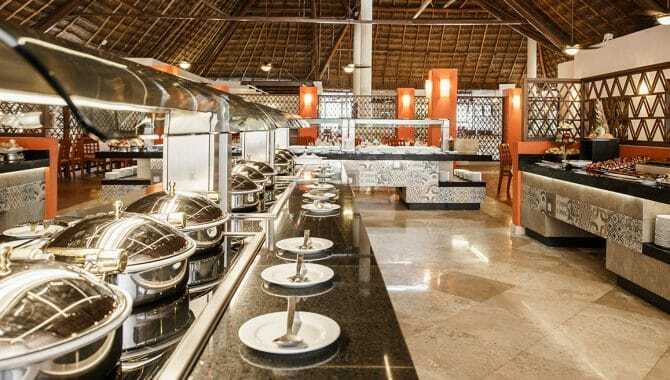 Taste the local cuisine buffet-style at La Riviera or relish the fresh seafood at Oceana. 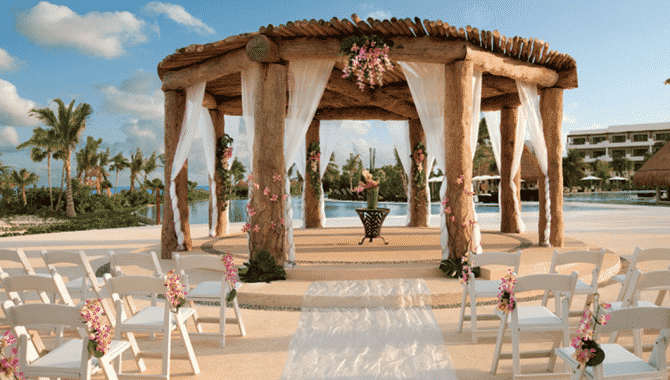 Planning a big day in Riviera Maya? 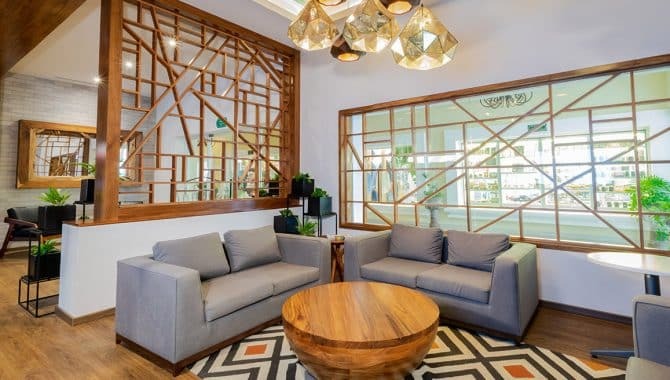 Stop by Coco Café to grab a premium coffee and snacks before you head out. 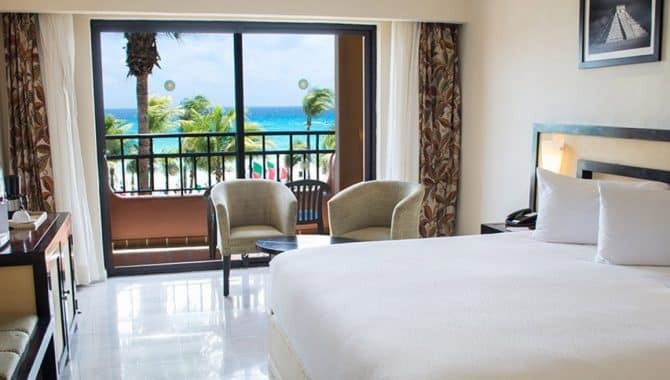 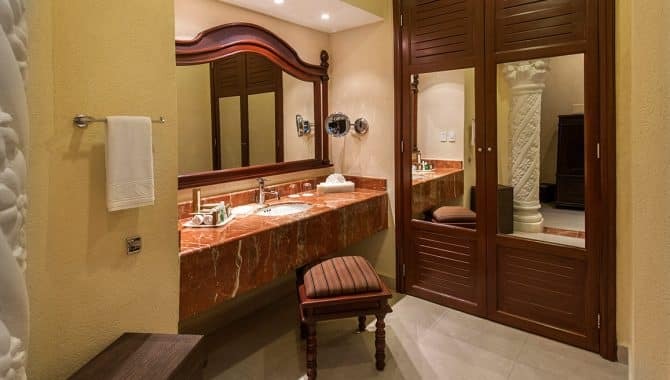 The Playa del Carmen resort’s 291 rooms and suites are elegantly furnished in a Mediterranean-style theme, featuring four-poster canopy beds and marble bathrooms. 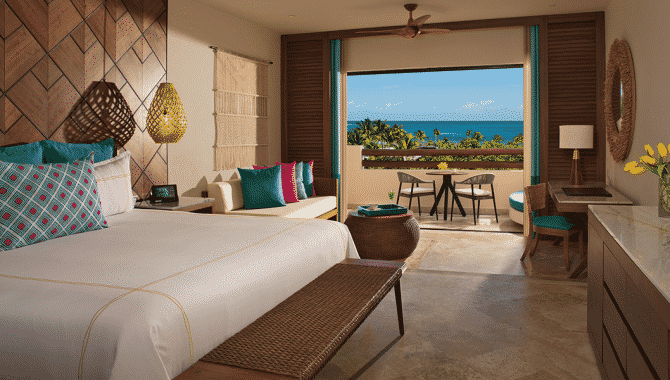 Guests can choose between ocean and tropical views, with each option offering a private patio or balcony. 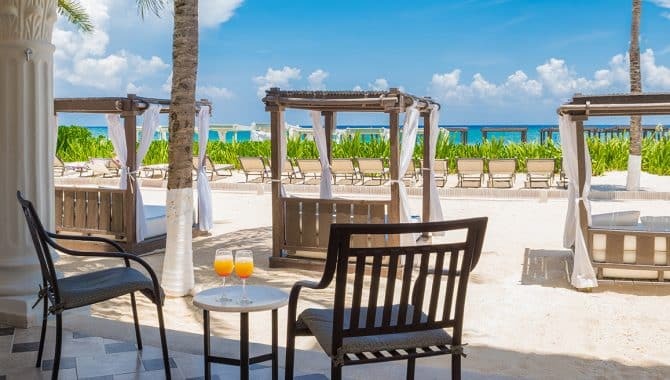 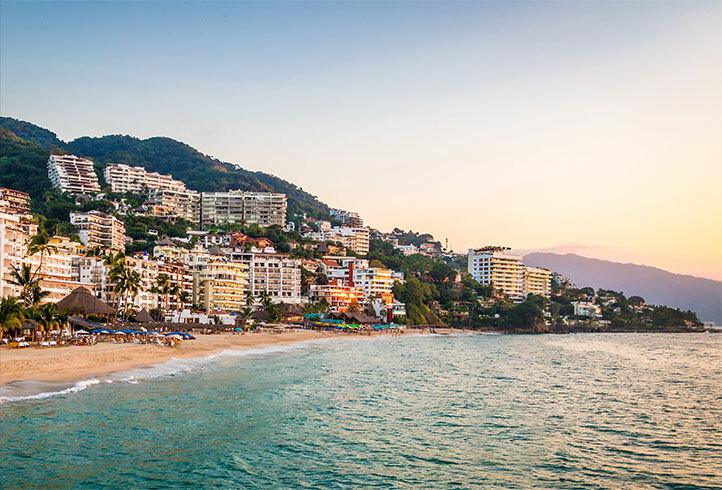 If you’re looking for a romantic getaway on a sun-drenched white-sand beach with plenty of sunbeds, cabanas and palapas, this is the place for you. 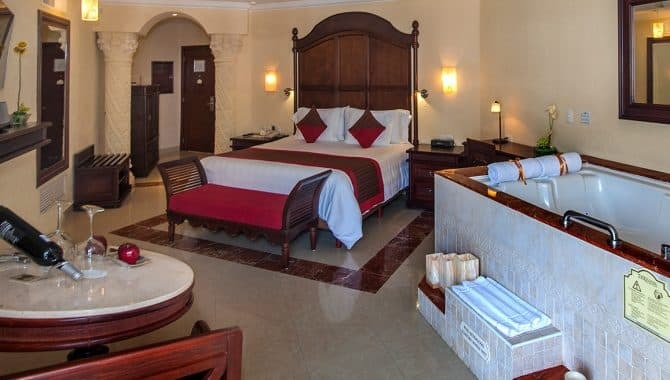 The rooms are spacious and tastefully-decorated with separate sitting areas and large four-poster beds. 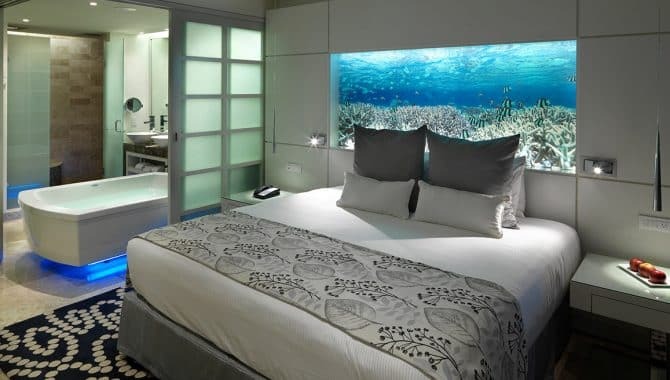 The ground floor rooms are swim-up suites. 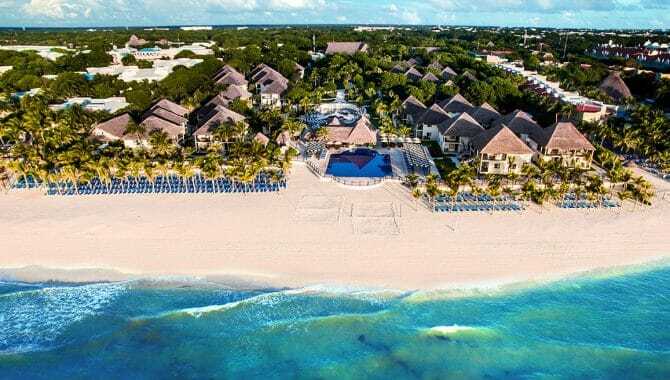 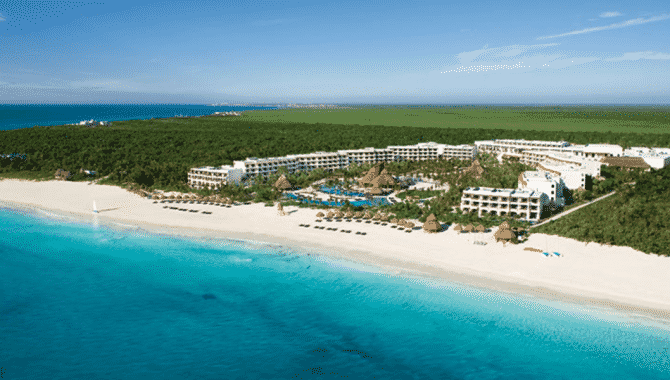 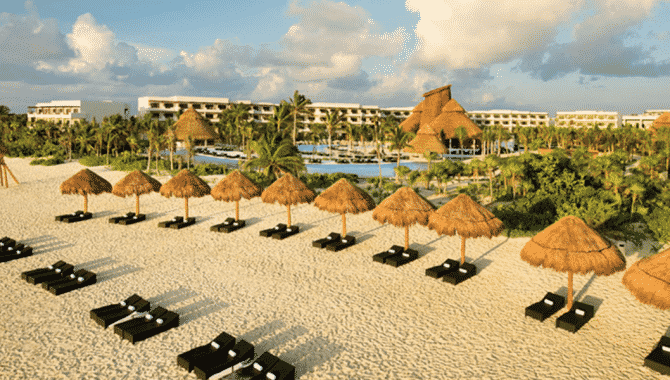 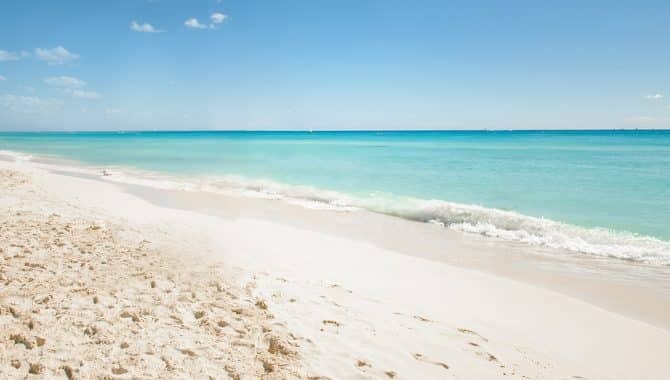 All-inclusive means exactly that at Secrets Maroma Beach Riviera Cancún. 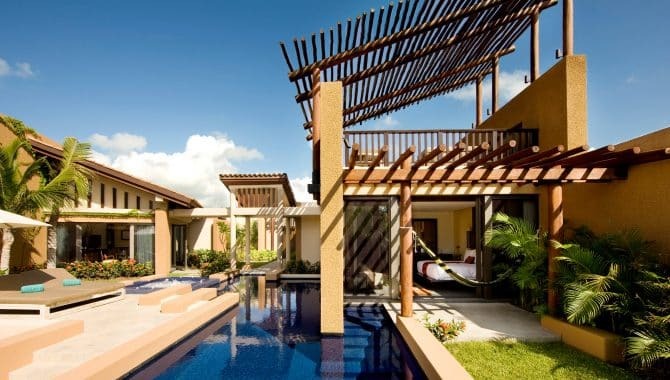 The resort doesn’t skimp on luxury and won’t surprise you with extras fees for the things you want. 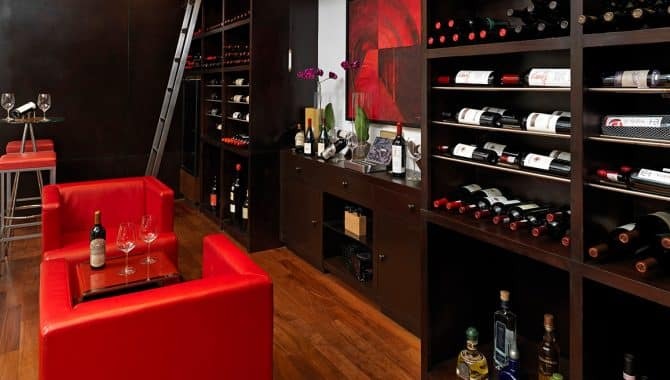 Enjoy unlimited top-shelf spirits at six different bars and lounges. 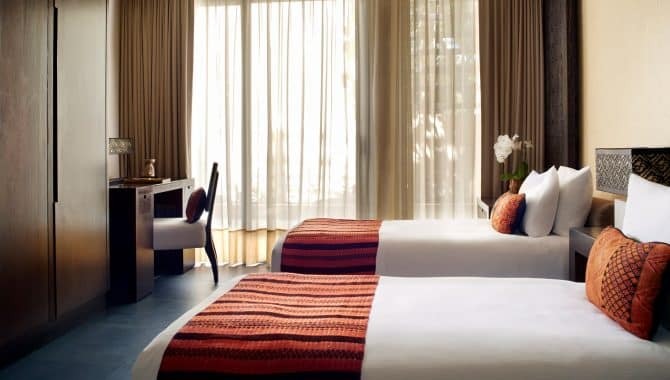 In-room minibars are refreshed daily with soft drinks, juice, bottled water and beer. 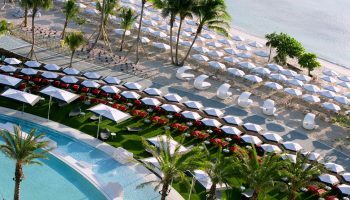 Impeccable wait service at the 13 pools and beach means you’ll feel like a VIP as you relax under the warm tropical sunshine. 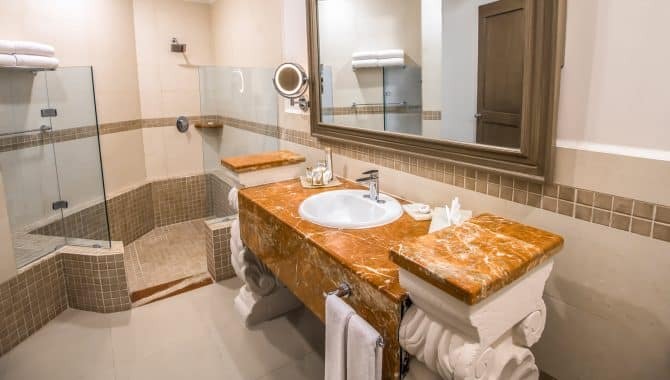 Twenty-four-hour room service is standard, as is free WiFi. 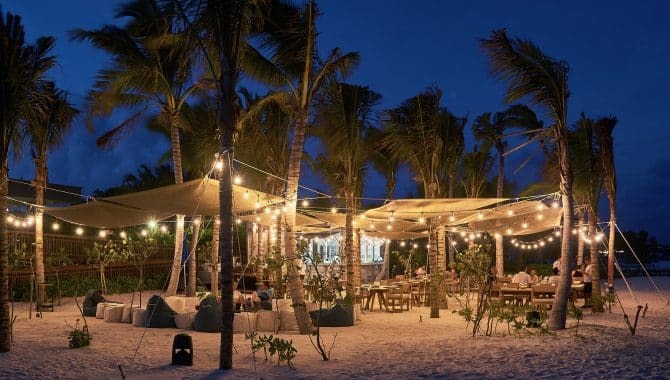 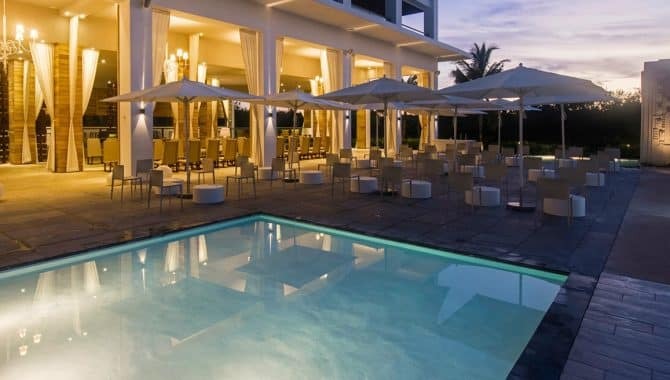 A host of daytime and evening activities, as well as various entertainment venues and theme parties held right on the beach, guarantee that there will never be a dull moment. 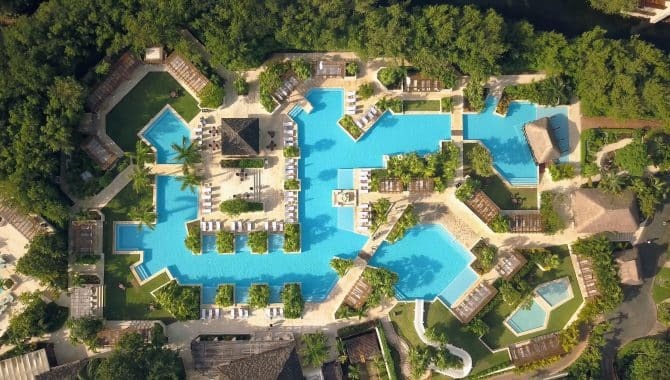 Tennis, ping-pong, archery, yoga, football, volleyball, dance classes, cocktail classes and various water sports are all available on site. 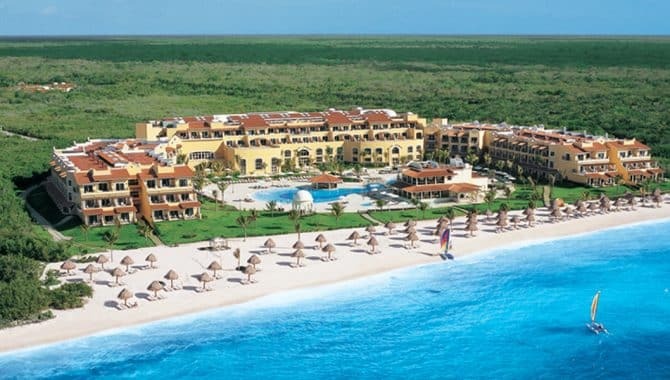 And if you want to hit the links, guests receive complimentary greens fees at the nearby Grand Coral Golf Course. 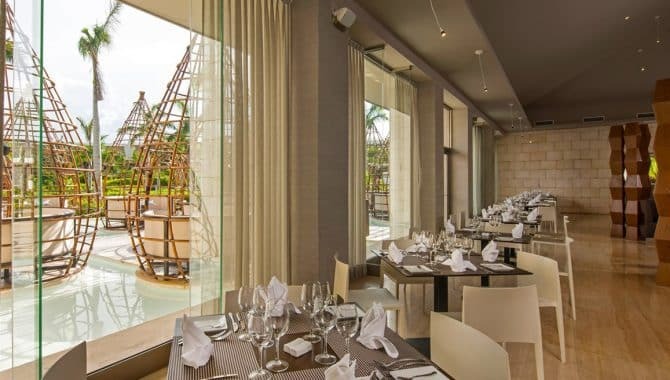 Reservations are never required at the resort’s six á la carte gourmet restaurants. 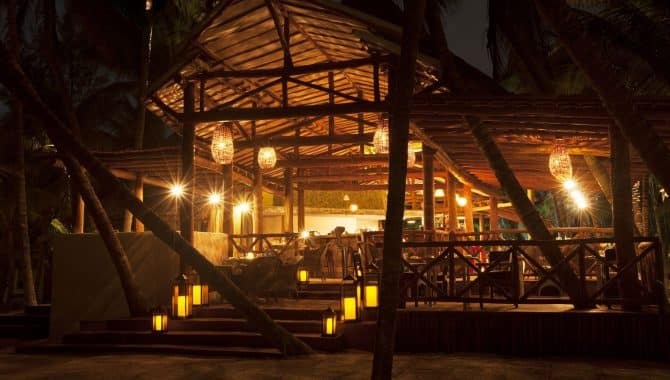 Choose from French, Mexican, Pan Asian, seafood, Italian and international. 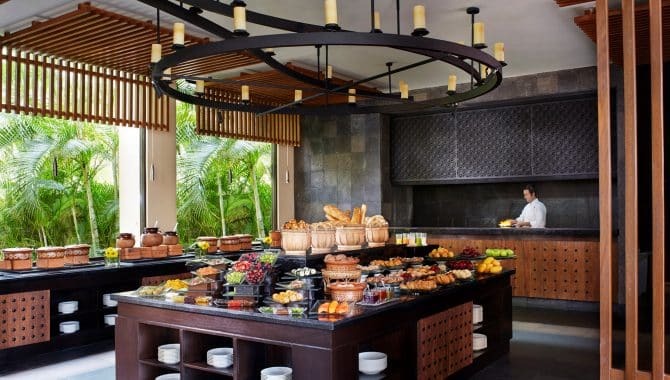 Check out the Barefoot Grill for a light lunch or the Coco Café for premium coffee and snacks. 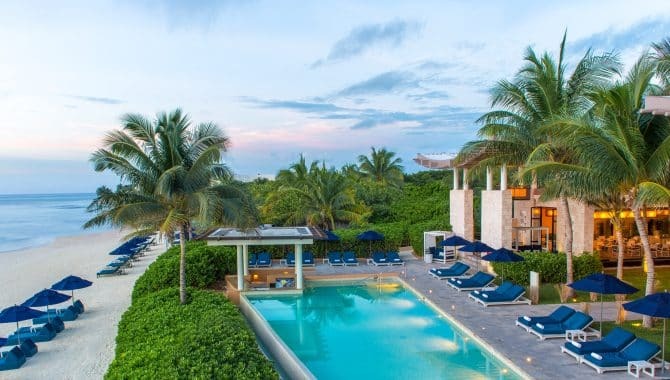 A warm greeting, complimentary cocktail and all, welcomes guests to the sprawling Fairmont Mayakoba resort, located in Playa del Carmen. 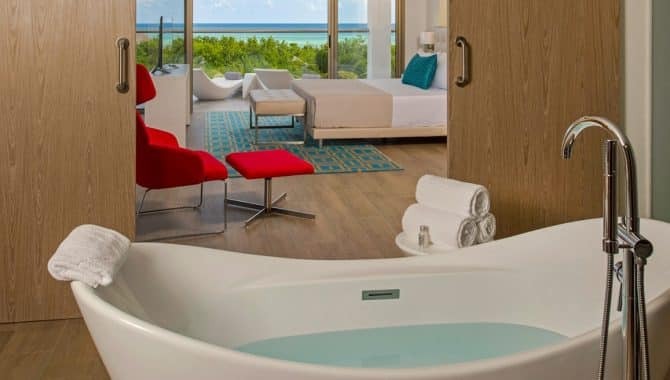 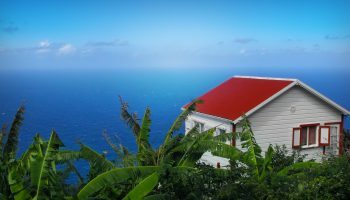 Here, romantic partners, families and even pet owners can easily customize the vacation of their dreams. 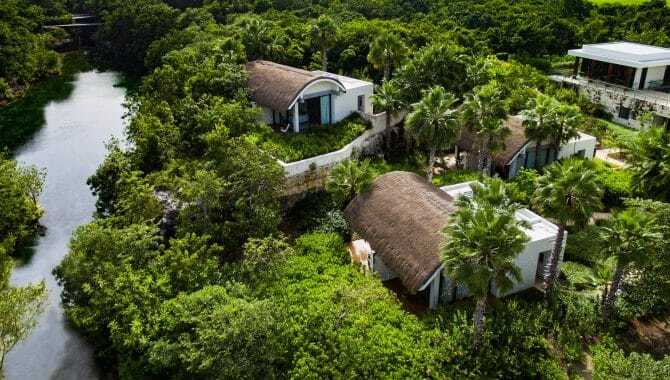 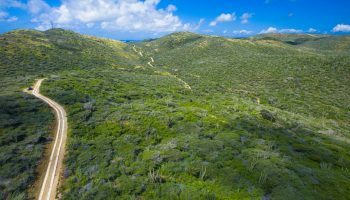 There’s a stunning, private white-sand beach, where shaded lounge chairs offer guests the opportunity to look out at the crashing waves or, if they choose, the untamed jungle scenery that surrounds the property on either side. 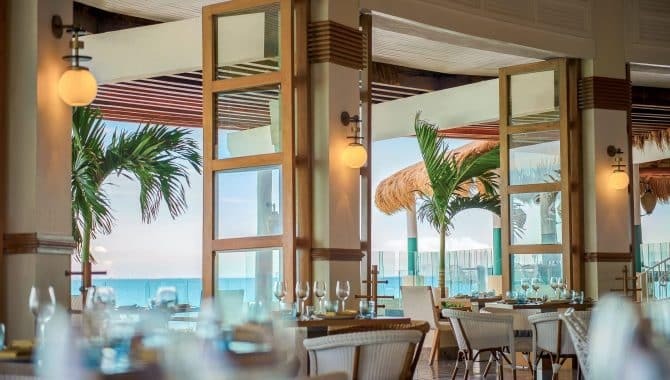 There’s also an impressive dining program, run by acclaimed Mexican chef Richard Sandovar, showcased across three impressive restaurants. 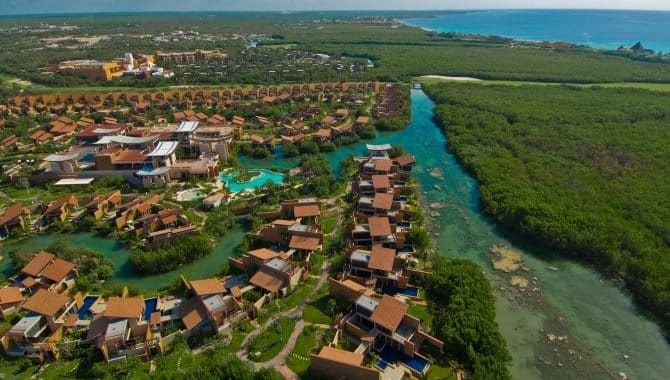 As far as accommodations go, 401 luxurious guest rooms, casitas and suites overlooking either jungle, lagoon or beach provide ample space for relaxation or as Fairmont Mayakoba puts it, “room to dream.” While this gated complex can be intimidating in its size, free boats, bikes and golf carts allow visitors easy, accessible transportation for freely roaming the grounds. 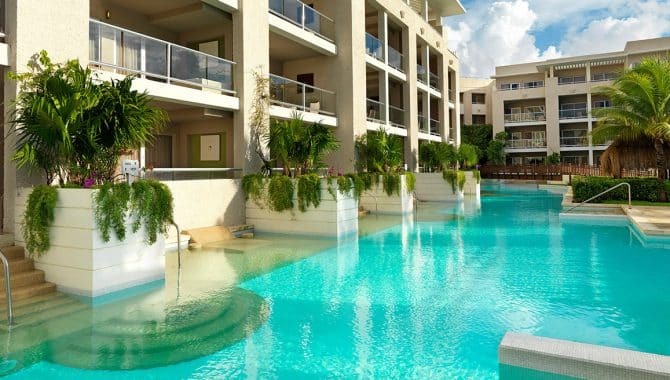 And there’s certainly a lot to explore, including a whopping five pools and four bars. 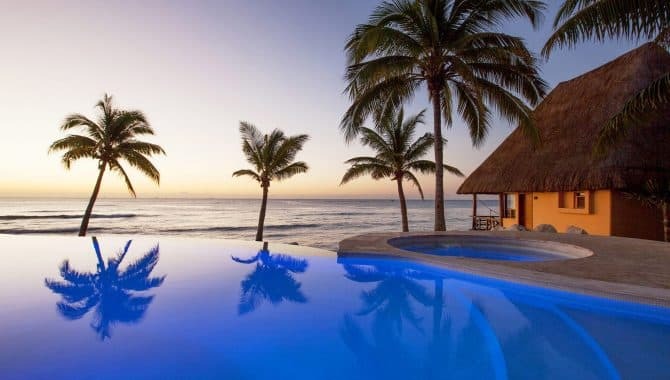 All-inclusive packages are optional but well worth it—it’s a great value and the best way to enjoy these exotic surroundings without opening your wallet. 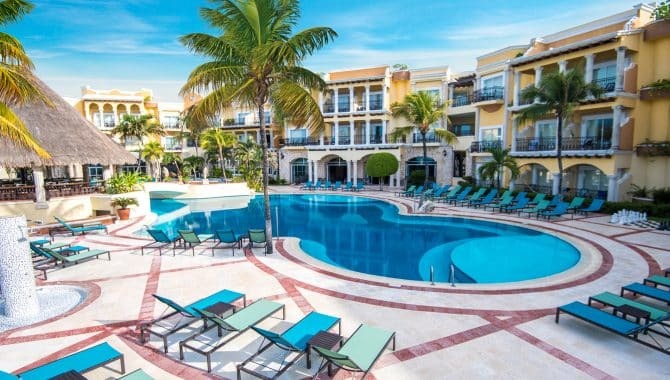 You don’t have to worry about hidden costs at Allegro Playacar, as “all-inclusive” means just that. 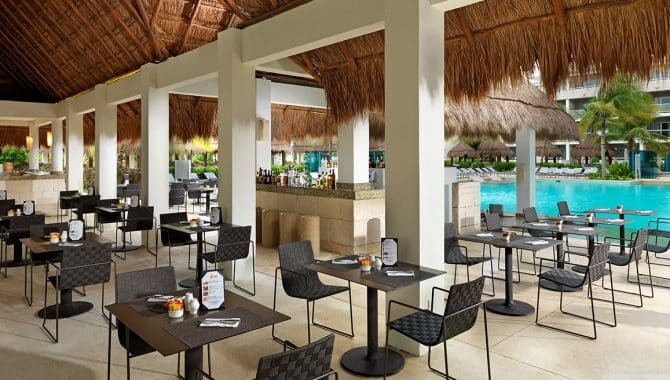 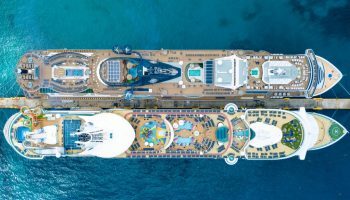 Three restaurants and five bars—including a swim-up bar—offer unlimited meals, appetizers, snacks and beverages. 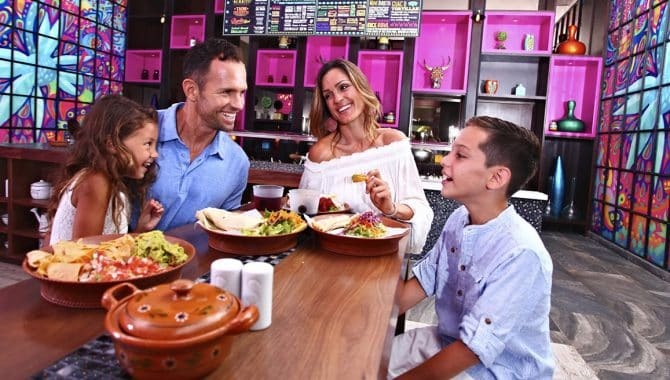 Choose from Mexican, Italian, International, Asian, pizza and grilled favorites. 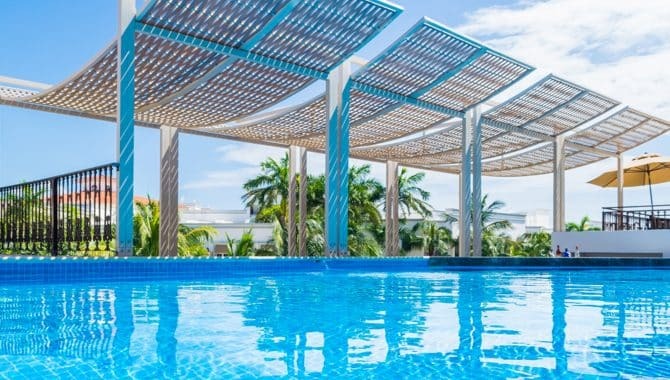 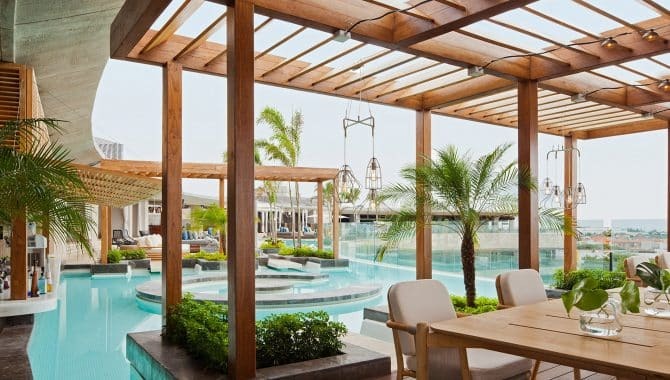 When you want to play sports activities include volleyball, tennis, beach soccer, diving lessons, kayaking, sailing and of course lounging in one of the two glimmering pools—one is active and lively and the other a designated quiet pool. 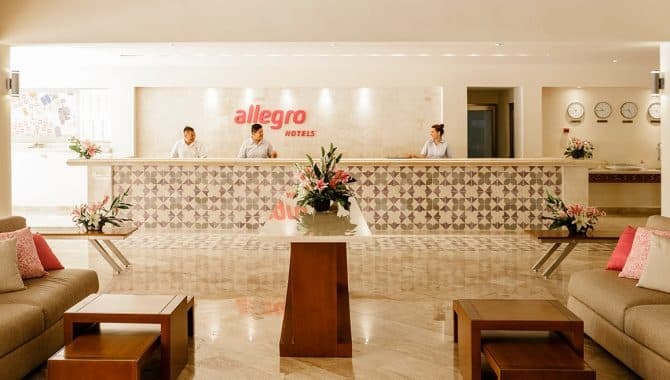 While all of this might leave little time to spend in your room, the accommodations at Allegro Playacar are bright, clean and comfortable. 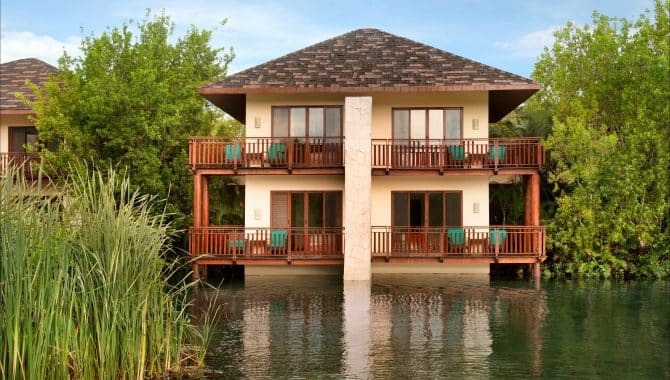 Caribbean-style bungalows with thatched roofs add to the picturesque setting of the resort. 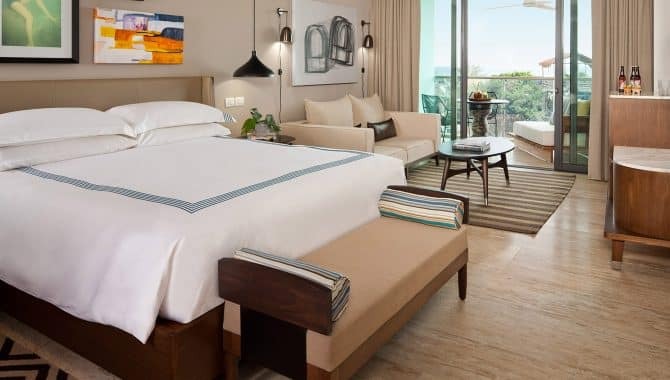 Amenities—depending on which type of room you choose—include a terrace or balcony, hammock, ocean view, king-size bed and in-room minibar. 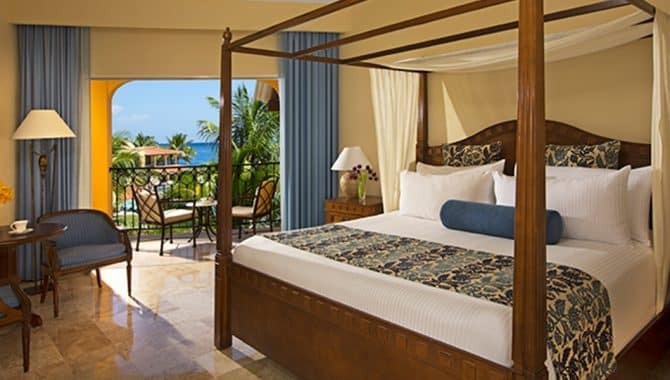 Family accommodations with two bedrooms and suite options are available. 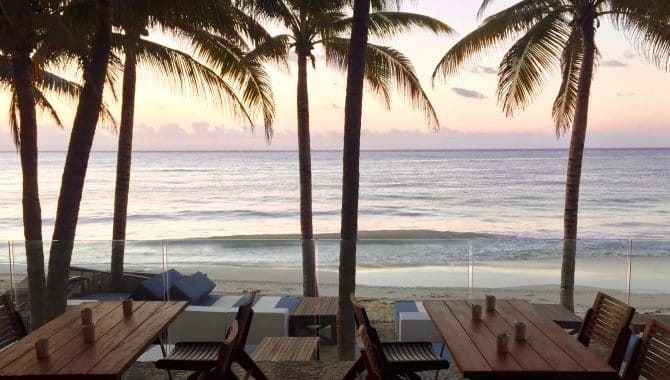 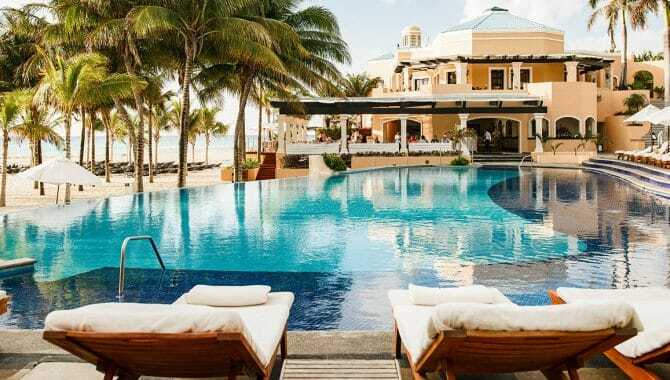 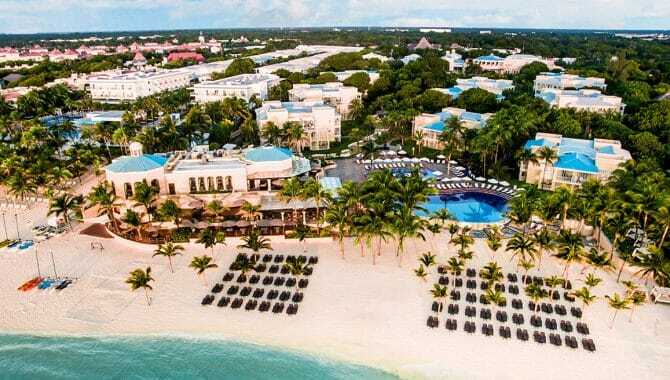 For a quiet, romantic beach getaway, couples can’t do better than this adults-only resort on one of the most spectacular slices of white-sand beach in the Western hemisphere. 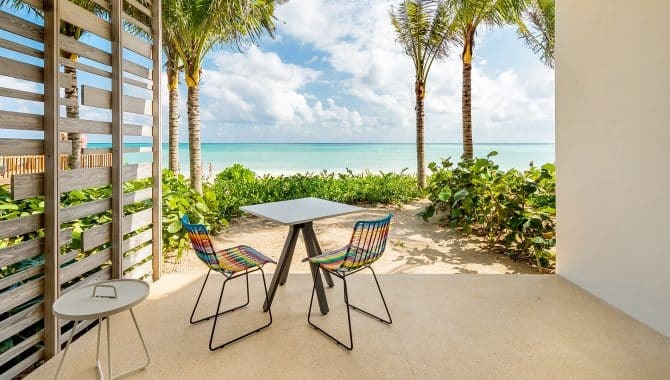 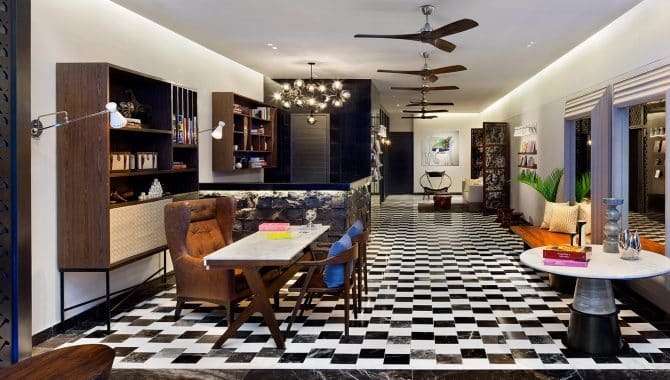 It’s the best of both worlds, perfectly located near—but not in the center of—Playa del Carmen’s pulsing downtown and eclectic La Quinta Avenida. 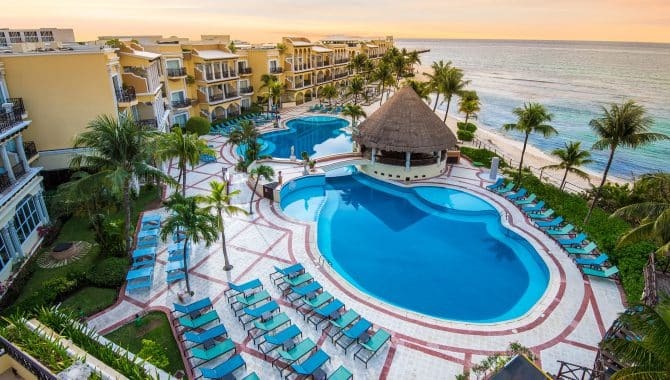 Royal Hideaway Playacar offers plenty of tranquility and solitude, and the fun, vivacious beach-town vibe of Playa is just a short drive away. 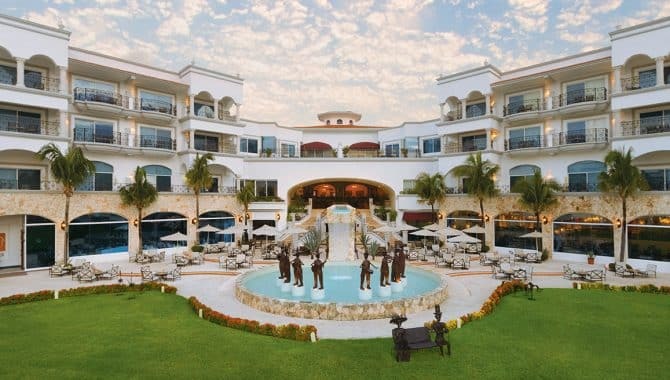 By the numbers, the resort boasts six swimming pools, six restaurants and 201 spacious rooms. 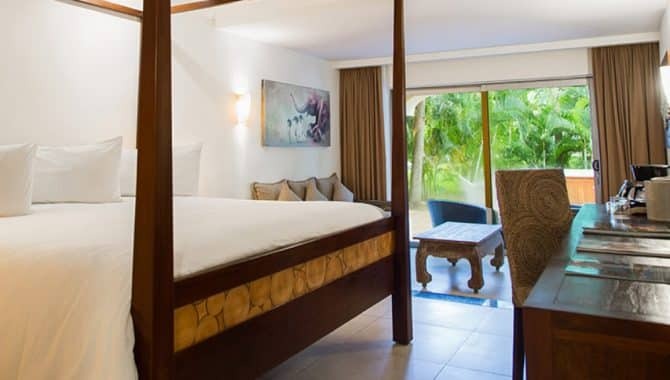 Take advantage of the spa and state-of-the-art fitness center or sip on an island cocktail at the solarium while sinking into a luxurious Balinese bed. 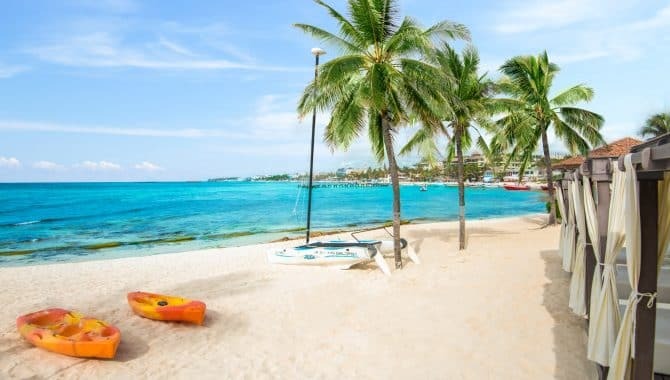 You don’t have to leave the premises for great outdoor activities: spend your day sailing, windsurfing, snorkeling, kayaking, fishing or playing tennis. 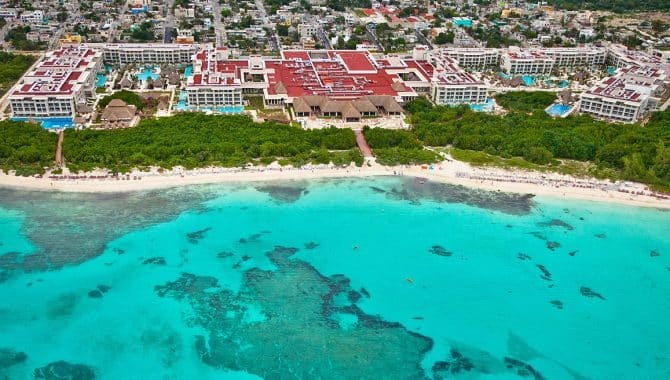 The Yucatán offers some of the best diving in the world, and the scuba diving center offers everything from A to Z: equipment sales and rental, lessons and classes for certification. 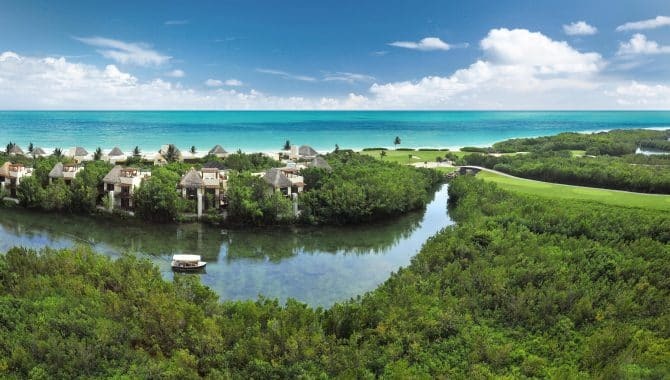 If you want to hit the links, no problem—a great golf course is less than two miles away. 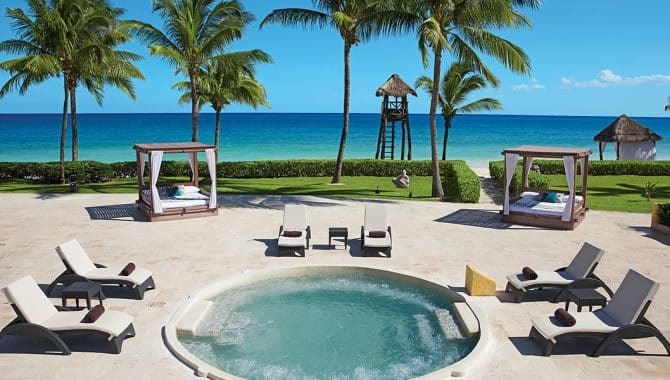 The Retreat, Royal Hideaway Playacar’s aptly named spa, deserves special mention. 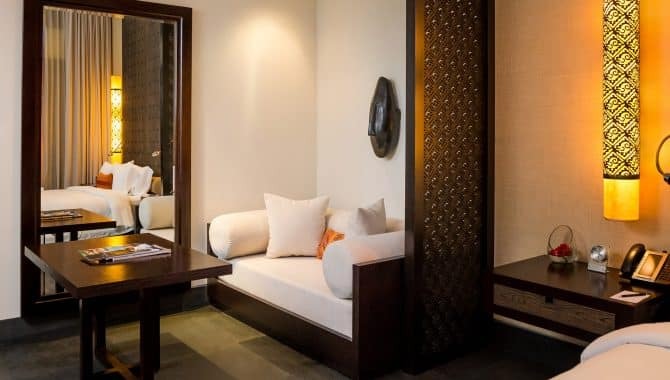 Couples and individuals can indulge in fit-for-royalty services, which include massages, facials, body wraps, aromatherapy, deep skin cleansing and revitalizing vitamin C therapy. 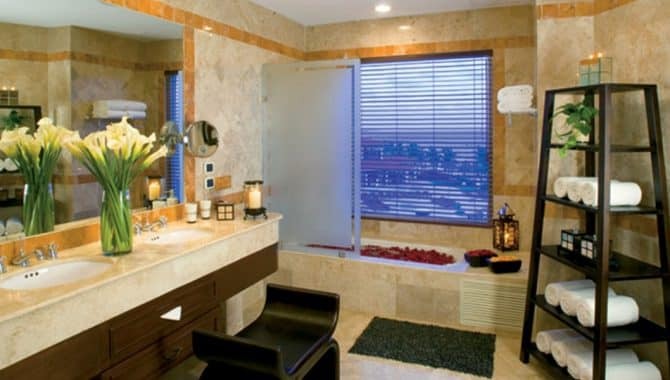 Privacy and discretion are always given proper attention. 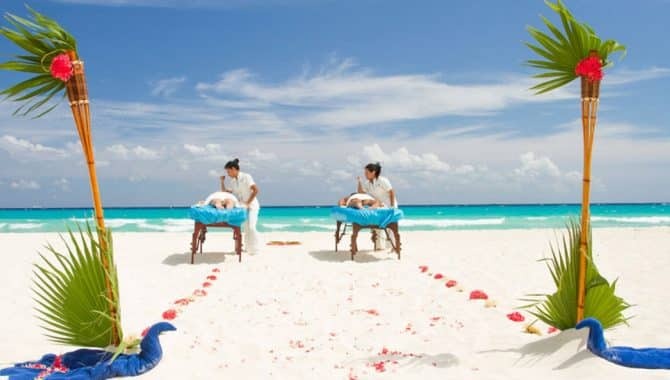 And could anything be more romantic than a massage by candlelight, right on the seashore? 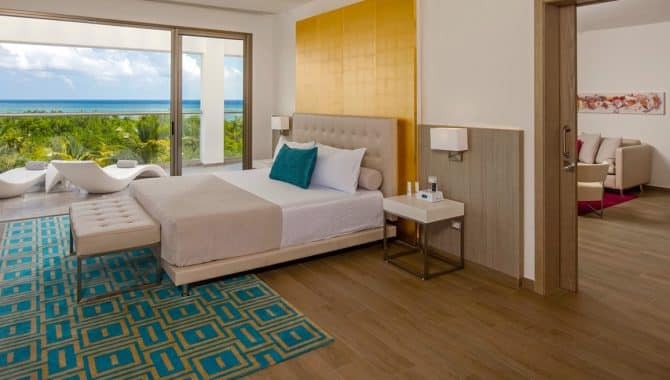 Spacious rooms and suites provide the ultimate in luxury, and all-inclusive means you’ll be spoiled from the minute you walk through the door. 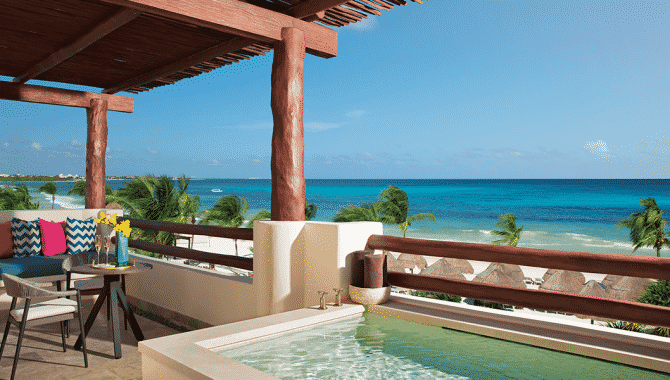 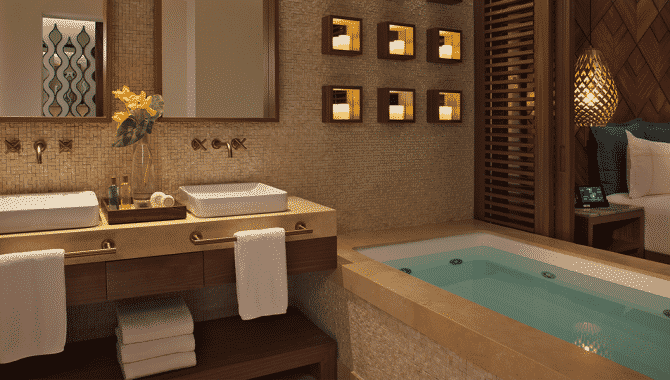 Swim-up suites are available, and most rooms have a private hydromassage tub. 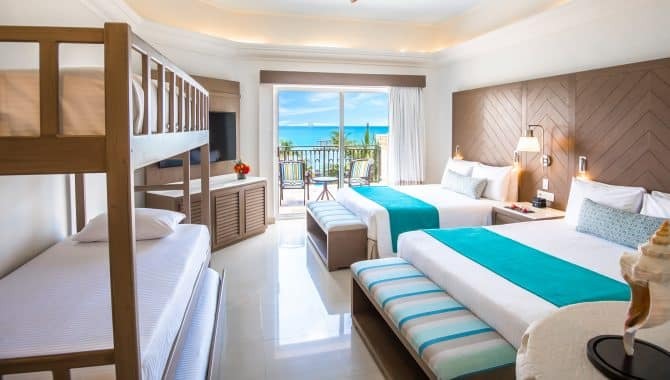 Feel like royalty as you while the day away poolside on a Bali bed, or sink your toes in the soft sand and drink in the glorious vista of the spectacular turquoise Caribbean. 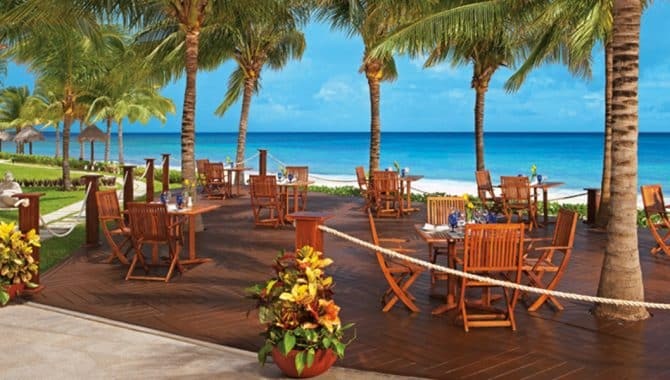 The resort’s 14 world-class restaurants have something to tease and please every palate. 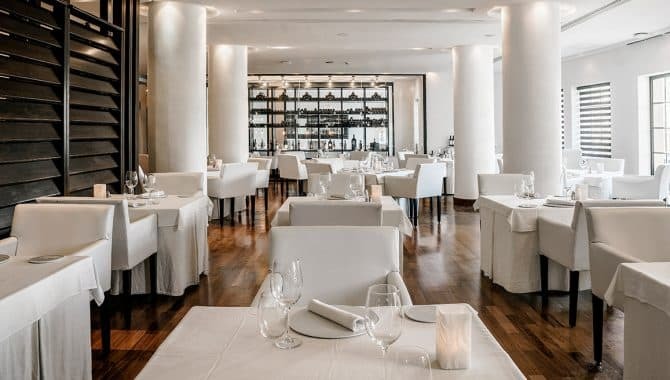 Latin, Mediterranean, Italian, Italian-Argentine, tapas, Asian fusion, International and Mexican cuisine are all available on-site, and Seven-Star Michelin Chef Martin Berasategui’s restaurant provides an elegant, adults-only dining experience that is second to none. 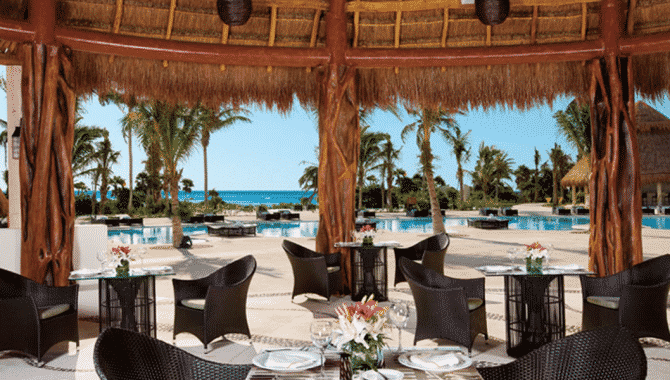 For a quiet, intimate meal or cocktail, choose from the resort’s several adults-only restaurants and bars. 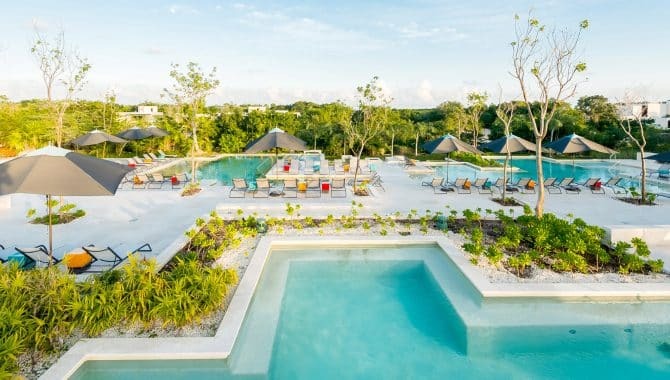 After getting a healthy dose of tropical sunshine at the beach or pool, Paradisus Playa del Carmen La Perla offers lots of activities including sports, leisure, entertainment and cultural programs. 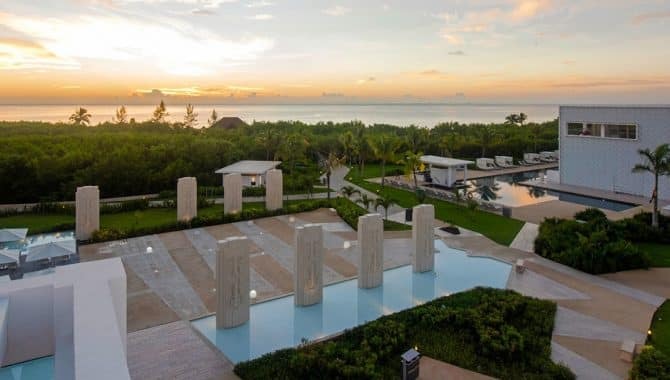 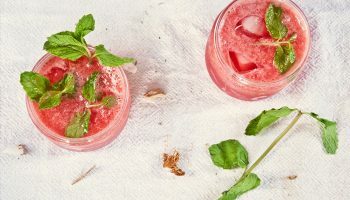 Volleyball, stretching, meditation, Pilates, tennis, water aerobics and various workshops—like wine and tequila tastings—are all available onsite. 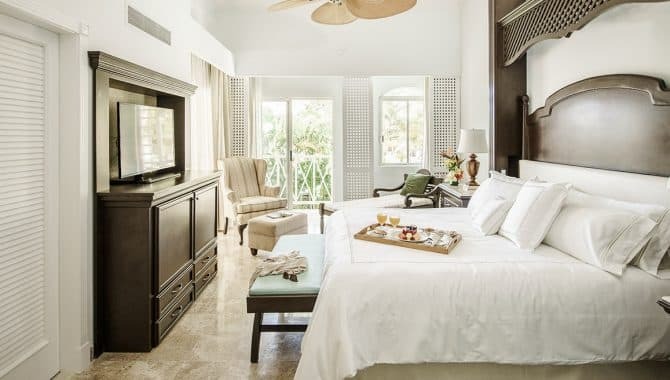 Upgrade to Royal Service for a truly sumptuous beach getaway. 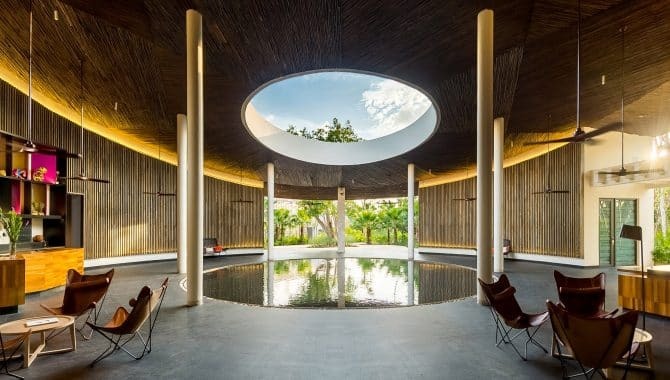 A personal butler, private terrace whirlpool, private swimming pool and a water ritual at the YHI Spa are just a few of the extravagances that give “VIP” an entirely new meaning. 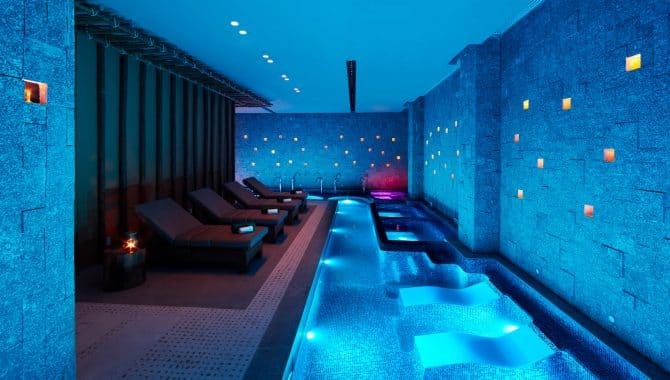 Indulge yourself!